Language is the magic power of human beings - a power available to all children. 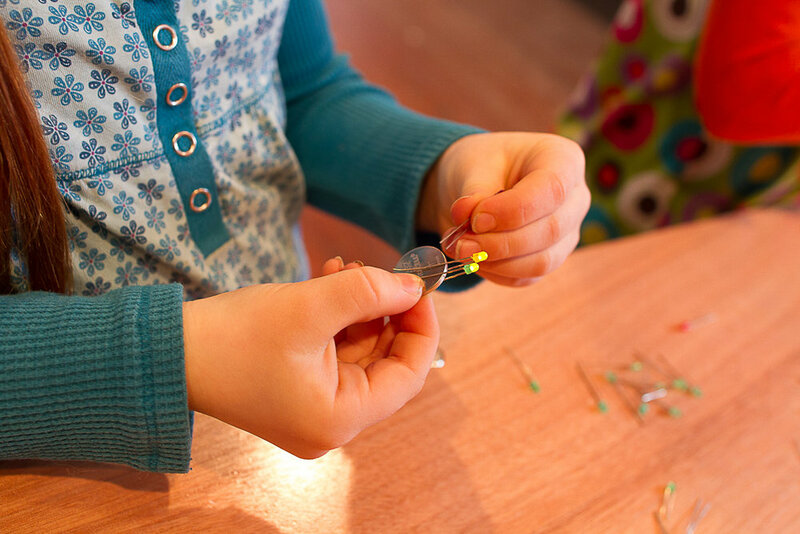 In this workshop, we created a space where children reaced for this power, played with it, and learned to wield it, free of expectation and pressure. Through the playing of a game, we conducted simple experiments in which children use letters and words to change the world around them. 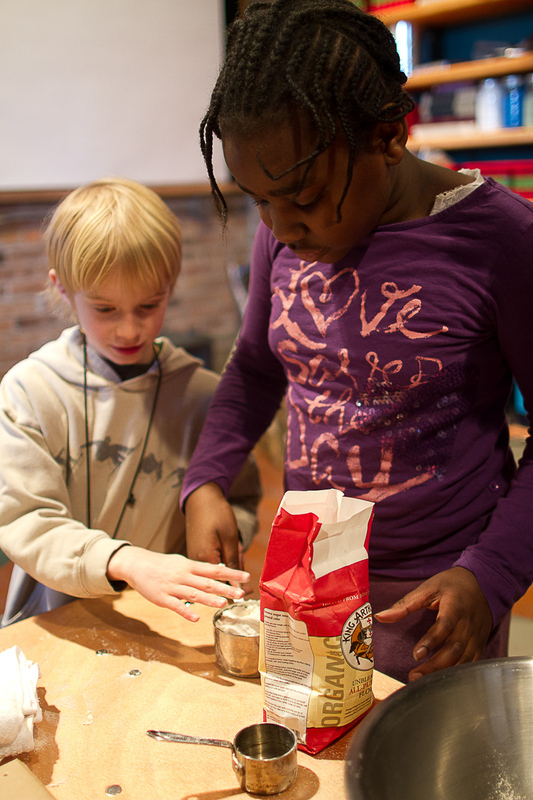 In winter 2013, we played a game with children that involved reading, writing, secret codes, and building big. The premise of Alpha & Omega was taken from the children's game telephone - a group of children sitting in a circle, passing a message from ear to ear, seeing how the message changes after multiple tellings. 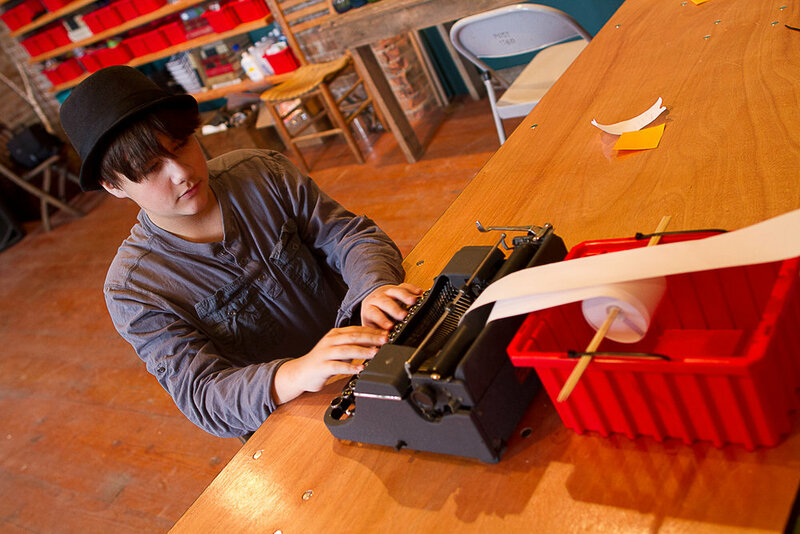 Our “telephone” had a different structure: a group of children gathered in our studio, set up as a nerve center, a communication hub, with a variety of different mediums through which to send messages - letterpress, morse code, waxed tablets, typewriters, telex machines, quill pens, radios. This was team Alpha. Team Omega gathered in the Main Hall, surrounded by tools for measuring and materials for making - wood, cardboard, paint, blocks, recycled objects. The game began when team Alpha was given a message they had to transmit to Omega. The message was visual & spatial - a blueprint for a building, a drawing, a painting, the plans for a machine. Their challenge was to translate something visual into language and transmit it to Omega, who attempted to decode the transmission and translate it back into the visual and spatial world. We used this premise as a departure point for ten weeks of play. The children directed the evolution of this game into more complex forms, adjusting it to encompass their stage of language development, while we, as facilitators, gently introduced new challenges along the way. 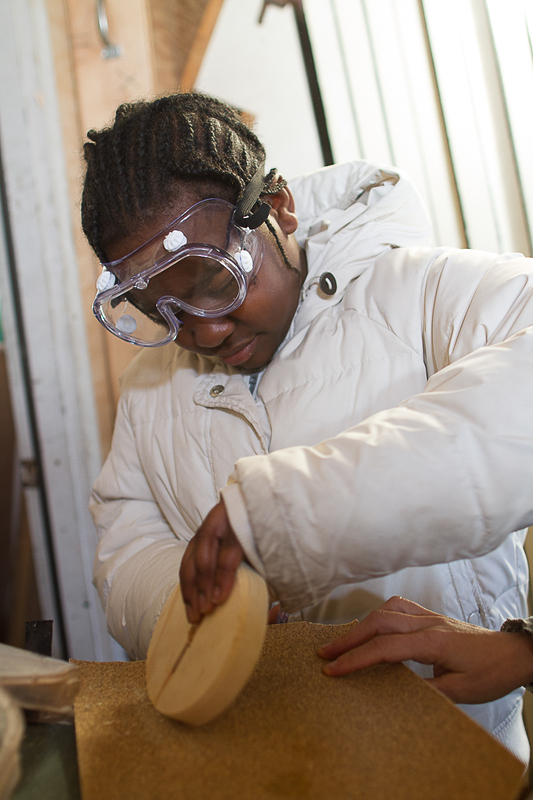 We welcomed our very first cohort of young participants by presenting them with a hands-on project to engage in as they trickled in the door: large brush-making. Using wooden mixing paddles for handles and hair extensions for bristles, each child created their own 3 to 5 foot long brush. We whipped up a wood stain with pigment and mineral oil to color our brush handles, embellished them with sharpies and engraved our names with soldering irons. 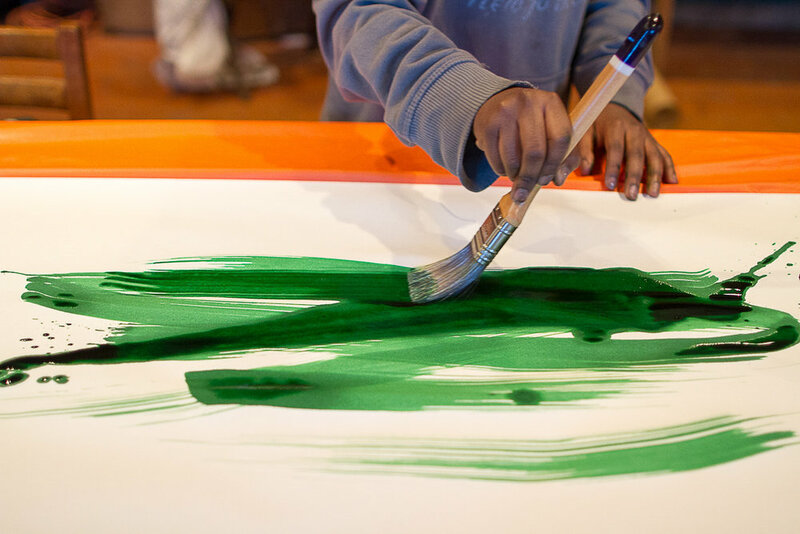 Making large brushes is part of our intention to explore how children can embody language: i.e. come to understand and experience language through kinetic activity that engages the whole body. We hope to suggest an alternate definition of "writing" for children in which writing shares the physicality of dancing, boxing, or fencing, in which writing is done standing up, in which writing can make the writer break a sweat. We broke for lunch and took a tour of the Basilica, where we ran into our friends Arone and Aron, at work fabricating a musical instrument for use by the Blue Man Group. After lunch, we completed our brushes by drilling holes for the bristles, and fixed them in place using some wooden circular segments cut from a disc. We made some ink with pigment and water, and tried out our brushes on a roll of Kraft Paper. We ended our day by moving our bodies a bit, playing tag in the Main Hall and pouring the ink we made onto the snow. Chef's wooden mixing paddle. We purchased a variety of different sized mixing paddles at a restaurant supply store in the Bowery. Ours were $15 for 42" and $19 for 54". They can be found on Amazon as well. We got ours at Wigs and Plus, 49 West 14th St, NYC. Any wig store should do. $2.99 per package at Amazon. One package is enough for 2-3 brushes. Drill holes in the business end of the mixing paddle. Experiment with different hole sizes. 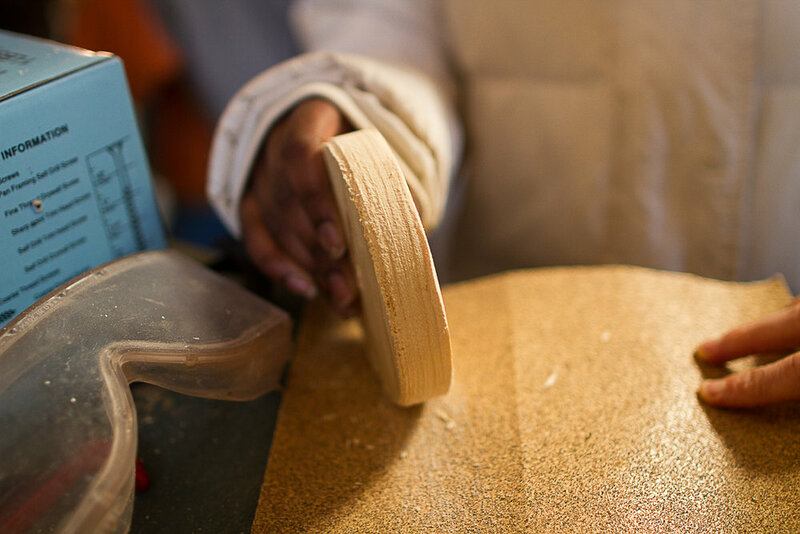 We made some wooden discs out of a 3/4" poplar board using a drill press and a 5" hole saw bit, and then cut three circular segments off of each disc. We clamped the brush hair in place using two circular segments and a cable tie, notching the paddle so that the cable tie gets a good purchase on it (see seventh photo at right). We recommend decorating with paint and sharpies, wrapping your handle with tennis racket grip tape or cotton bicycle bar tape (get fancy), and engraving with a wood burning pen. We began with a game we're calling intergenerational telephone. Children arrived and fashioned cardboard signs to wear around their necks. On one side, they wrote their name in small letters at the top. On the reverse, they wrote the name of a culture or a people in the world, such as: "The Miwok," "The ancient Egyptians," "Sicilians," "Muslims," "The ancient Greeks." Some children chose a culture they were interested in, some chose their own culture, or the culture of their ancestors. We arranged chairs in a circle, and began by introducing ourselves and talking about why we chose the cultures we had written on our signs. We then stood up, organized ourselves by age from oldest to youngest, and sat down again in this order. 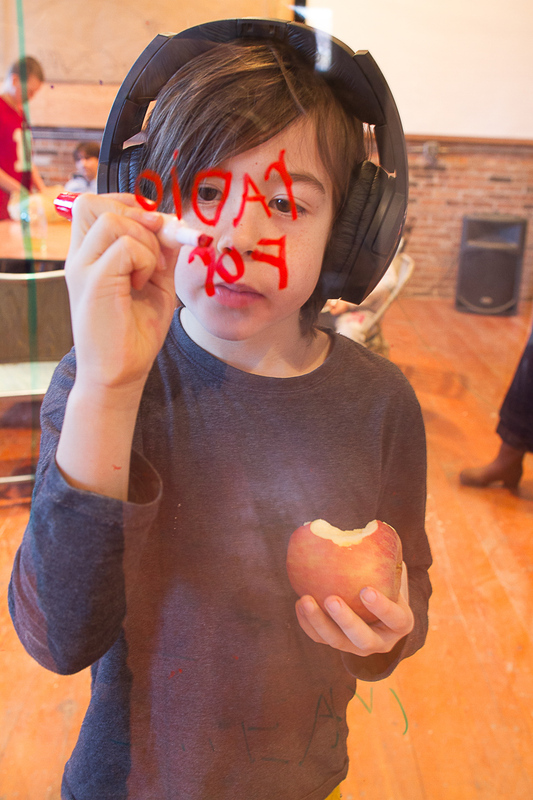 The youngest child, a boy of 6, we dubbed "Son," and he wrote "Son" on his cardboard sign. The slightly older child to his right we dubbed "Mother," and she wrote "Mother" on her sign. The child to her right we dubbed "Grandfather"; the child to her right we dubbed "Great-Grandmother," and so on up to the oldest adult, who ended up with the title "Great-Great-Great-Great-Great-Great-Grandmother." The premise of intergenerational telephone is that Great-Great-Great-Great-Great-Great-Grandmother is getting on in years, and wishes to pass her most precious knowledge down to her descendants. We experimented with different types of knowledge that 6xGreat-Grandmother tries to pass down: an aphorism, a recipe, and a story. After a couple of rounds, we added a recording device into the mix, holding it up to our mouths as we whispered the messages around the circle. We played the recording back after each game, and analyzed the decay of the message, which was hilarious. Our results: Aphorisms either held up pretty well, or were changed to another, similar aphorism, usually by an adult. Recipes decayed very swiftly. 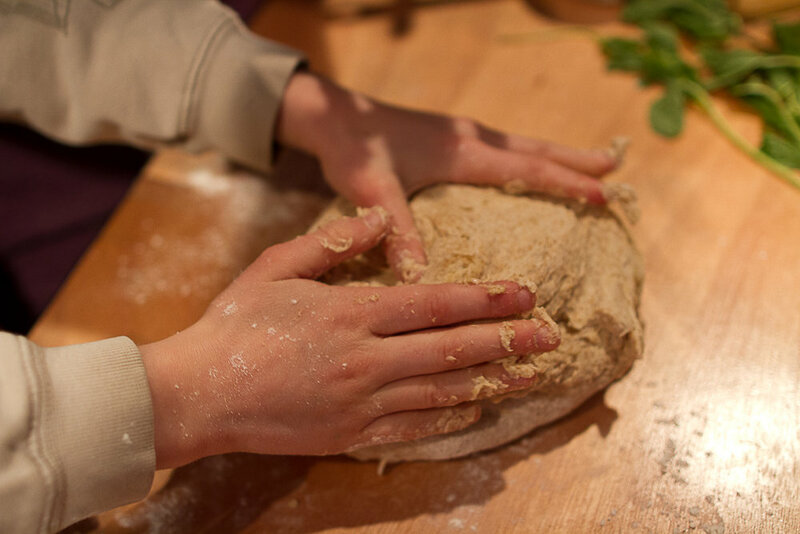 A recipe for pie crust: One cup flour, One stick of butter, A quarter cup of ice water, A pinch of sugar and salt - was passed down from generation to generation. It arrived at the "son" as: A cup of salt, A cup of oil. Stories resisted decay well. When words did get changed, they were changed into other words that had the same meaning. We concluded the game with the observation that the ability to write things down would make this game a whole lot easier. We contemplated the game as a simulation of the necessity from which writing arose: the desire to communicate over time, across generations. We returned to the cultures we had written on our signs and asked, "Do the Miwok people have a writing system? Did the ancient Egyptians have a writing system? Ancient Greeks? Sicilians?" and so forth. We briefly explored one child's superabsorbent polymer collection, and then moved on to paint-making. We made a traditional hide glue paint, mixing various ochres and acrylic pigments with water and rabbit hide granules that had been soaked overnight (see 26th image at right). We then devised a new model of large brush, using bamboo tiki torches and mop heads. After lunch and a few games of street hockey, we took these into the Main Hall and tested them out using water as ink on the concrete floor. We practiced large brush calligraphy, and played a game in which two writers faced off, one mirroring the other, creating a composition of a word fused with its inverse. Prior to making the brushes, we watched these video clips for some inspiration: Calligraphy on a large scale, and A making of big brush painting. 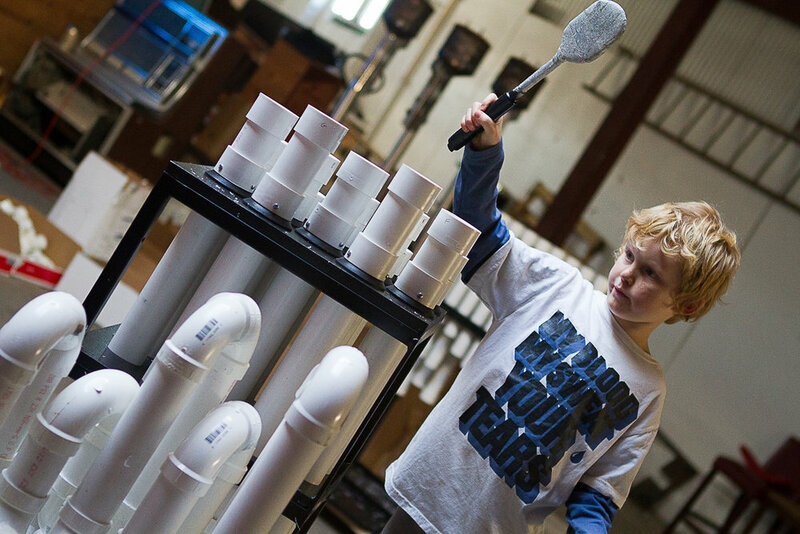 We took a more in-depth look at the instruments Aron and Arone are building for the Blue Man Group. Returning to our Studio, we mixed up some more water-based paint and tested it in the snow again, making some Technicolor snowballs. At the very end of our day, we watched this film about artist Motoi Yamamoto. It was intended to provoke thought about the various large spaces we have access to at our site, and how we might use them creatively. We discussed how Motoi Yamamoto plans out his installations, and marveled at his ability to sit still for such long periods of time. We purchased eight pigment colors - 4 ochres and 4 acrylics - as well as some rabbit hide granules at Kremer Pigments, 247 West 29th St., NYC. See here for the recipe we used. For more on our visit to Kremer Pigments, see here. We had some 60" torches lying around, and we purchased some 48" torches on Amazon. The 48"s are thinner in diameter than the 60", and are subsequently more brittle and prone to breaking at the end where they are split. We recommend the 60" ones. 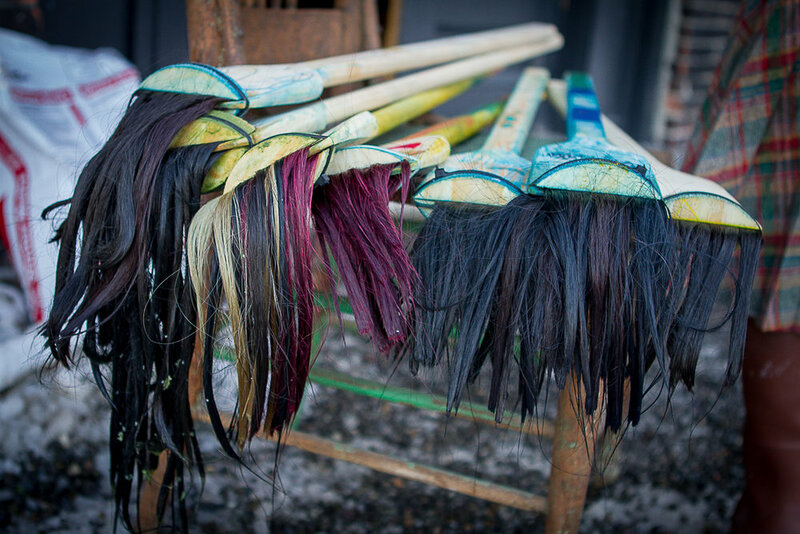 After some trial and error, we found these synthetic mop heads to be very supple and silky, and make for good brushes. We purchased them at our local grocery store. Strangely, they are more than double the price when purchased online. We used cotton mop heads as well. Roll of mesh. The mesh was useful mostly in the process of inserting the brush head into the split bamboo, which could be tricky. 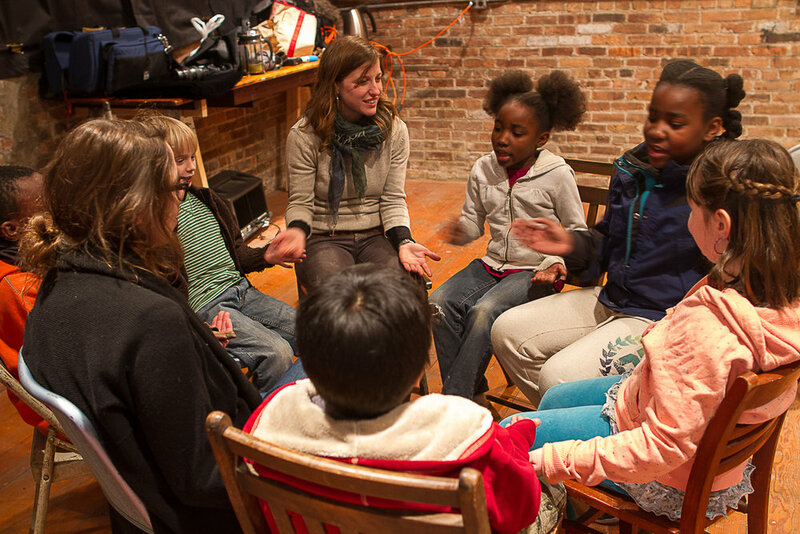 For our Sunday crew, we began with a round of intergenerational telephone, as described above. We then moved into bamboo large brush-making. A small crucible of strange goo was produced by one of our participants, so we explored its properties for a short while. We played some street hockey in the Main Hall, and returned to the Studio to make paint together. We watched a series of film clips about Kolam, a South Indian art practice in which rice powder is spread on the ground by hand to create intricate patterns. We laid out some sheets of wood on the floor of the Gallery, and tried our hand at it with some machine-ground rice flour from an Asian market in NYC. We found the rice flour to be difficult to control by hand in the style of the Kolam artists, and suspect that they use a much coarser grain of flour for their compositions. We added a little bit of color to the rice flour, too. corn starch, water, pancake mix, coconut water, baking soda, shredded coconut, as well as a cassette-feu with a pot of vegetable oil atop it, and various mixing and measuring implements. In the Studio: A laptop running Skype, connected to our projector, provided us with a video of the goings-on in the other room. 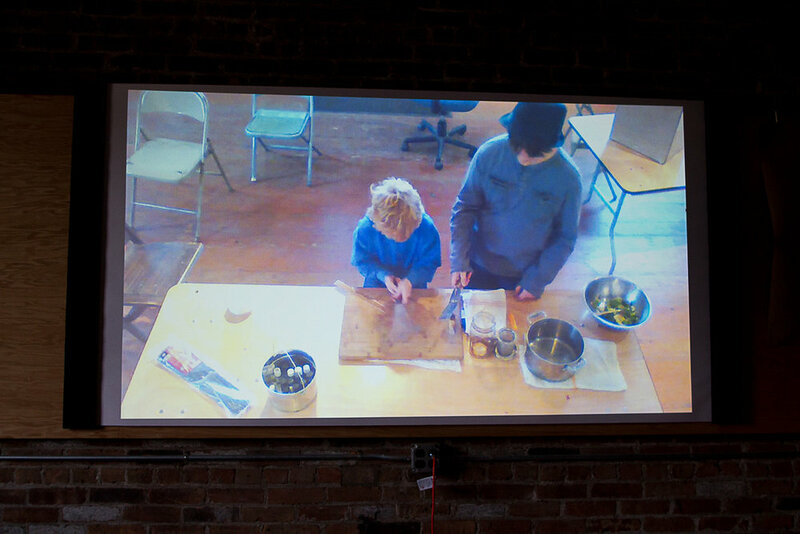 (The video feed was one-way: the kids in the gallery had no such window into the Studio.) A table with a typewriter, loaded with a roll of receipt paper. Between the Studio and the Gallery: A sheet of Kraft paper sealed the rooms from each other. A small slit cut in the Kraft paper served as a portal through which only written language could pass. 1. 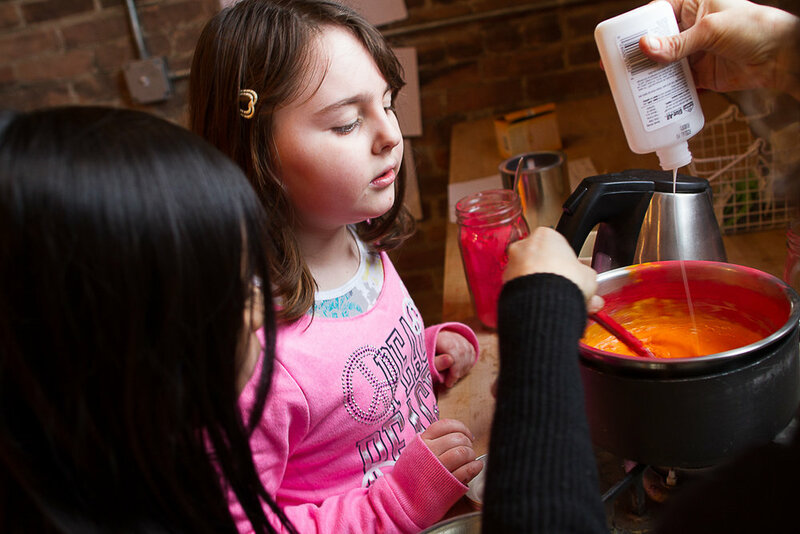 We want the dish to be challenging for kids to decipher by looking at the raw ingredients. We hoped that fried bananas would lie enough outside the everyday experiences of our participants that they would truly need Alpha’s recipe telegrams in order to progress. The game is inherently cooperative in nature: success is achieved by successful completion of the recipe, and measured by both teams as they eat fried bananas. Victory was tasted by all that day. Our game wrapped up in the afternoon, so we enjoyed the fried bananas with a late lunch and then went into the Basilica for some basketball. We concluded our day with a walk to the river, where we looked at barnacles on the floating docks that had been removed from the river for the winter. We laid some coins out on the train tracks, waited for the train to pass, and then collected our new currency. We discussed how we might use flattened pennies as the official coinage of Kite’s Nest, with the train tracks as our mint. We played a round of Intergenerational Telephone to break the ice this morning, to help everyone learn each other’s names and get to know each other a little better. We then dove into our second game of Alpha & Omega. The concept was identical to Tuesday, except that instead of a recipe, the information Alpha had to transmit to Omega was a set of instructions for the making of an object. In this iteration, Alpha and Omega are again in separate rooms. Each room has a table covered with an identical set of tools and materials: drills, wood, metal rods, cans of beans, candles, sharpies, bolt cutters, etc. The difference was that Alpha's table-set also contained a completed version of the object Omega was to build. As with the fried banana recipe, we chose the object to build in the hopes that, if you were confronted with the necessary tools and materials to build it, the nature of what you were building would be non-obvious. We wanted participants to spend most of their time building the object “in the dark,” hanging on the contents of each instruction received. For this, we chose a candle-powered carousel, similar to the one described in this how-to. The cans full of beans produced much puzzlement, and were especially effective at throwing Omega off the scent of what they were making. 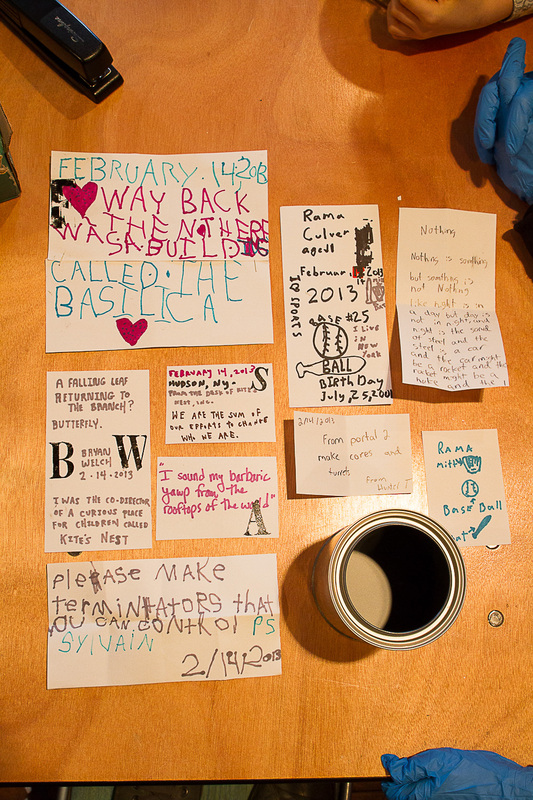 Though the beans were not needed for the build, they were collected in Mason jars and consumed by staff that evening. No beans were wasted in the making of our carousel. We abandoned the typewriter this time, and switched to handwritten notes. Diagrams were forbidden. The hardest part of the game was when Alpha had to instruct Omega to make 8 equidistant punctures along the bottom rim of the can. For this, the Alpha kids drew a picture of a clock for reference, and told Omega to drill holes at 12, 1:30, 3, 4:30, 6, 7:30, 9, and 10:30. Omega then drew a clock of their own, and used it to make their punctures just right. In the middle of our game, we broke for lunch, and ran out to throw snowballs at a freight train that was creeping through the riverfront. We collected more pennies that we had set out on the tracks in the morning. The game concluded when Omega, following instructions to the end, lit the candles on their lantern and caused the tin can to spin. Alpha, still observing a vow of silence, invited Omega into a darkened Studio, and both teams sat in the quiet and watched their lantern cast light on the walls. In the little time that remained, we grabbed the jars ofcolored ink that we had made the previous week, poured them onto some snowballs, and hung an 8’ sheet of white paper on the exterior wall of the Basilica. We threw our snowballs at the paper: they exploded in vivid hues. Today we introduced the practice of starting our day together with a morning meeting over tea. We took requests for different tea flavors (caramel & blueberry are at the top of our list). After tea, our Sunday group jumped right into preparations for a third iteration of Alpha & Omega. Based on a review of Tuesday and Thursday's gameplay, we adjusted the game a little bit: instead of splitting the group into two equal teams of Alpha and Omega, we tried an asymmetrical game plan. This time Alpha consisted of two older children accompanied by Nicole. The rest of our participants divided into two equal Omega groups - East and West - and occupied the Studio, which was divided into two sections with hanging blankets. We set up a monitor at the front of the room, visible to both East and West. On the monitor was a chat window, enlarged so that the youngest participants could easily read the letters. East and West each had a table covered with ingredients and cooking implements. East and West each had a cassette-feu with a pot of vegetable oil atop it. Sara worked with Omega East, Kaya worked with Omega West. The little Alpha group set up shop on a desk in the Gallery. We used Skype video conferencing again, so that Alpha could see the Omega groups (but not vice-versa). Alpha could only communicate to Omega East & West via chat. Today’s recipe: poori and raita. Our selection was guided by the principles as described above. We framed today’s game as a cook-off, and invoked some of the theatrics of TV cooking shows. We stretched a piece of tape across the entrance to the Omega kitchen (the Studio), and counted down the start of the game (“Chefs ready? 3... 2...1... to the kitchen!”). Participants ran into the Studio, breaking the tape. The Alpha participants doubled as journalists covering the event. In between sending messages, they crossed the border into Omega’s kitchen, and conducted radio interviews of the contestants. Each team had pen and paper, and took notes now and then to help remember certain instructions. Participants took turns cutting cucumbers; blending the raita; mixing and kneading the dough; balling the dough, and rolling it into small, thin sheets; frying the dough in hot oil, and watching it puff. When the teams were asked to divide a ball of dough into 20 equal pieces, they drew a diagram to assist their cutting. Omega East and West kept remarkably good pace with each other during the game, completing their dishes almost simultaneously. We expected that the teams might get out of sync, and have to refer back to messages no longer visible on the monitor, but this was not the case. The game ended in a meal together. Each team tasted the other’s poori and raita, and we discussed the origins of the meal we had made. We concluded with hockey. Having lost our last wooden hockey puck, we fabricated another one using a drill press, a 5” hole saw bit, and a ¾” poplar board. We sanded the edges smooth, and went into the Basilica for a game. Our participants came in this morning to find a 4’ x 6’ glass dry erase board mounted in the doorway between the Studio and the Gallery. 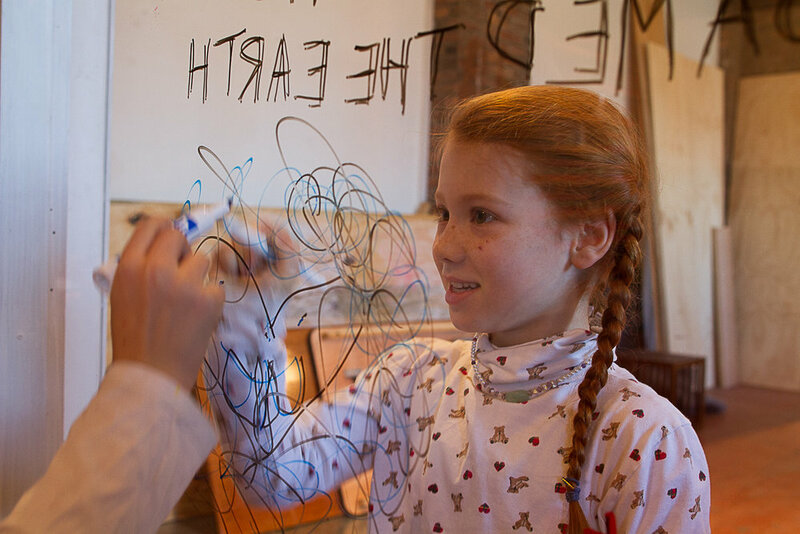 Sara and Kaya had begun to play with it, taking turns tracing each other’s writing backwards on the glass. The children immediately grabbed markers and tried their hand at backwards writing. The leading writer adjusted their writing pace, so that the following writer, facing them through the glass, could keep pace and trace their words. Participants switched roles often, trying out all the permutations of leader/follower/forwards-writer/backwards-writer. 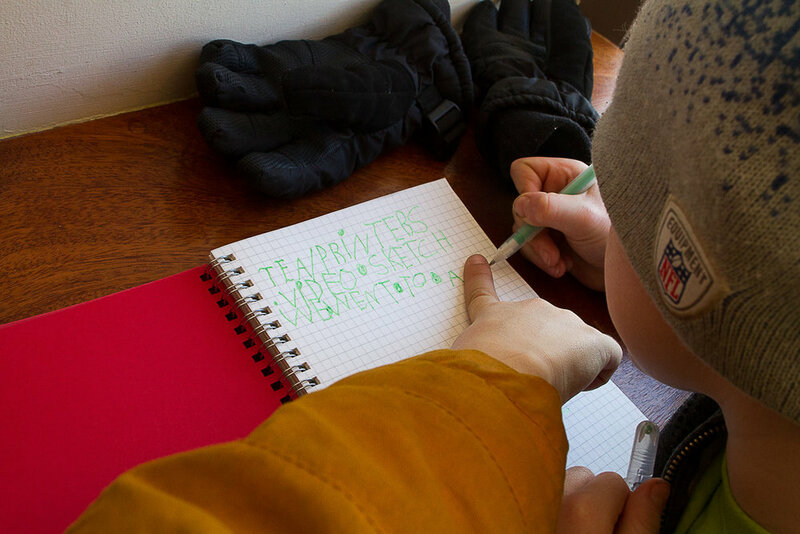 Children not yet able to write on their own traced the writing of a more confident writer, in real time. Children seemed to lose themselves in the physical act of writing, writing swiftly and fluidly, following the strokes of their partner through the glass. We allotted this activity a generous part of our morning, until, at the moment we perceived the group as hungry for a new form of engagement, we placed a pair of wireless headphones on the head of one child. The transmitter was connected to our PA system, into which we plugged a microphone. I began speaking quietly into the microphone. “If you can hear me, put one finger into the air.” “Now write the words “Radio For One” on the glass.” “Pat your head and rub your stomach at the same time!” The messages could only be heard by the wearer of the headphones. I gave the listener a few silly directions over the wireless, and then asked him to put the headphones on Nicole, and to take over my spot on the microphone, giving some silly directions to Nicole. As kids began to figure out what was afoot, they took turns as the Broadcaster and the Listener. The unspoken agreement was that the Listener had to do whatever the Broadcaster intoned, and the Broadcaster couldn’t ask the Listener to do anything detrimental to themselves or others. Kids made adults stand on chairs and do the Hokey Pokey, they directed me to run outside and jump in the air, they told each other stories, they pretended to be on the radio. I whisper a message to a Broadcaster. The Broadcaster speaks the message into the microphone. 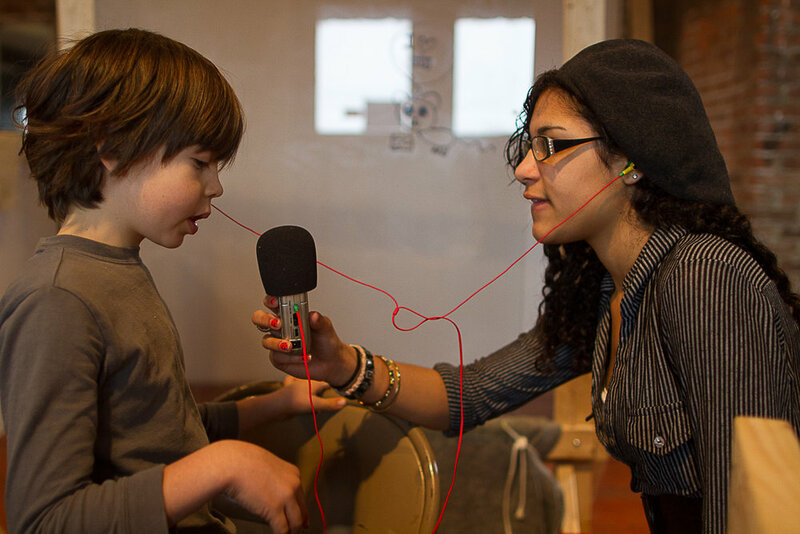 The Listener (with headphones on) whispers the message to a Typist. The Typist enters the message into a chat window. 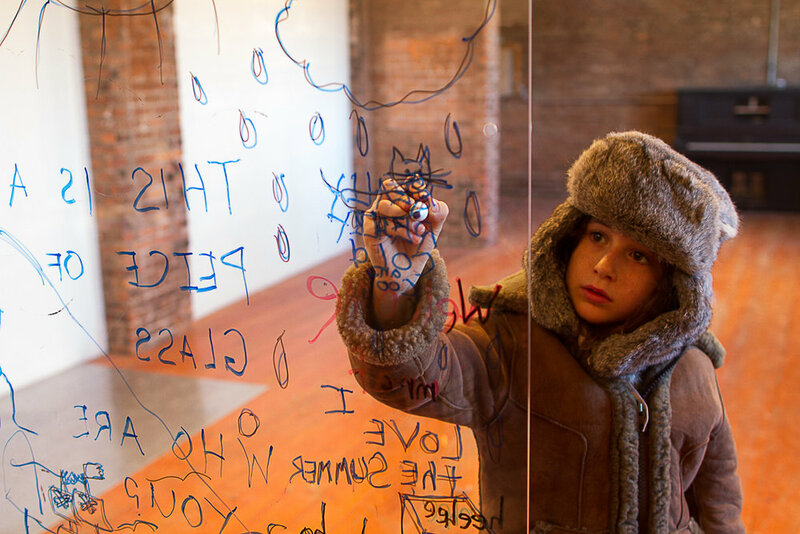 The Writer reads the message, and writes it backwards, on the glass. The Reader, standing on the other side of the glass, reads the message, and passes it via walkie-talkie to the Scribe. The Scribe, wearing a blindfold, writes the message down (on a mirror, just for fun). Sent: Yesterday was Martin Luther King’s birthday. Received: Yesterday was Martin Luther King’s birthday. Sent: The best things in life are not things. Received: The best things in life are not things. Sent: Many hands make light work. Received: Many hens make life work. We spoke about the context and meaning of each of these sentences. We agreed that, though "Many hands make light work" is a true statement about the world, "Many hens make life work" is equally true. We ended the day with some hockey. On Tuesday afternoon, I had taken a trip out to visit master letterpress printer John Barrett and his establishment in Springfield, MA, called Letterpress Things. See here for a set of photos from the trip. On Thursday we began the day with tea, looking at the photos I took of John’s print shop, and watching some footage I captured of his modern and antique letterpresses at work. 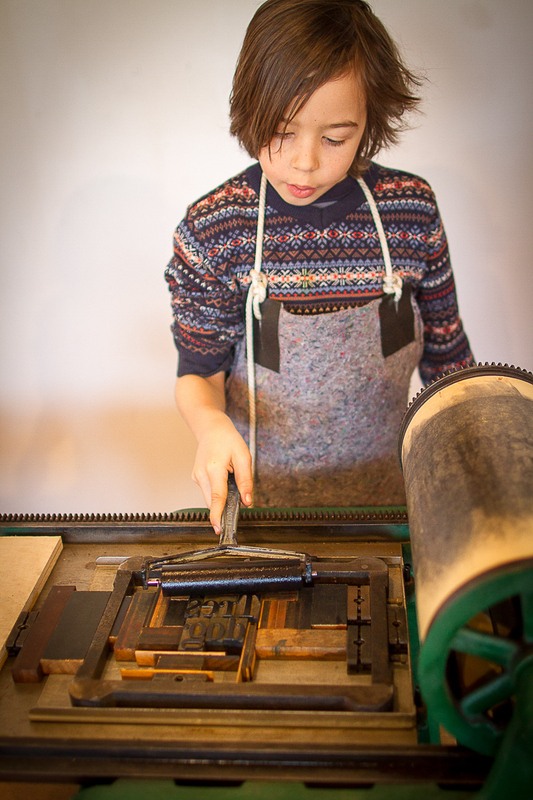 We then presented the children with a variety of letterpress printing plates, purchased from John. Promising we would play with the printing plates when we returned, we left the Nest for the purpose of purchasing a journal and a writing implement for each participant. We headed for Sketch, where everyone selected a journal and pen that matched their style. We also picked up some ink suitable for letterpress printing, and a brayer to apply the ink. We walked over to Bonfiglio & Bread to pick up a couple of loaves for lunch. As it happened, there were enough empty window seats at the counter for us to all sit down in a particularly cozy shaft of sunshine. We suggested that everyone pull out their new journals and write about the week so far. One child, a relatively new to reading and writing, announced to me that he was not in the mood for writing. I wrote a journal entry for him. His younger neighbor - still working on mastering the alphabet - asked him for help, so he read my journal entry out to the younger child and coached him through the writing process. We lingered at Bonfiglio & Bread longer than anticipated, enjoying the sunshine. Upon returning, we toasted the bread and ate it with our lunches. Putting my new letterpressing knowledge into practice, we attempted to set up an ad hoc printing press (really more of a “stamping” press). We used a mirror as a platen to spread our ink on, and held the printing plates in place with some plywood offcuts as furniture. We rolled out a long sheet of white paper across two tables, and tested out the various plates, in green and orange ink. An older participant had been expressing interest in photography, borrowing one of our early-model DSLRs to take pictures of our printmaking. We ducked out for a moment to go on a little photo safari inside the L & B factory building next door, and took some pictures in the hauntingly-lit space. We discovered that if you erase one of the sides of the glass, you are left with one half of a story, which creates an opportunity for another person to fill in the missing words, perhaps taking the story in a new direction. This could be repeated across many participants, a recursive Mad Libs that marches on to infinity. We then headed out into town, stopping at Sketch to pick up some journals for the Sunday crew, and then to Bonfiglio & Bread, this time to take a quick tour of the kitchen, and to buy a couple of loaves. We returned and jumped into the exercises that set the stage for a game of Intermodal Telephone (see above, Thursday). In this iteration, one of us played the role of a sailor at sea whose boat had foundered on a rock. The sailor sends out an SOS on his radio, and his message is received by an old blind and mute woman who lives alone on a desert island, passing her days listening to her shortwave and watching the sea. 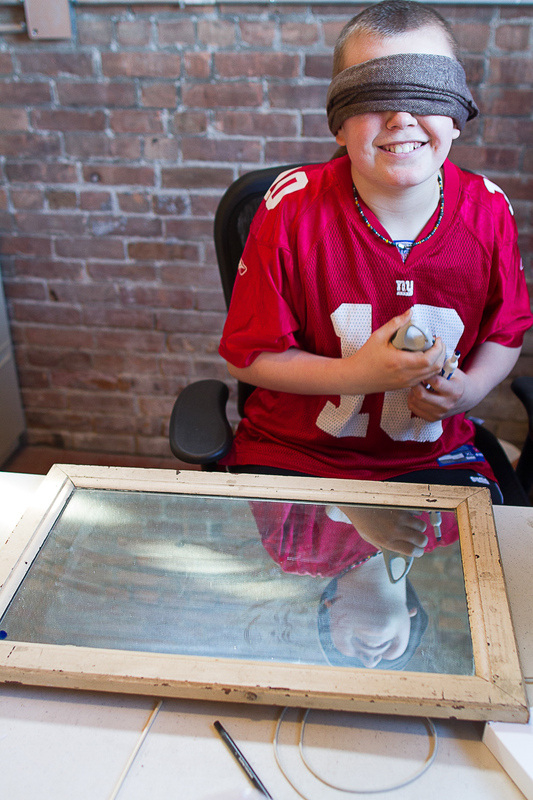 She writes his message on a mirror, and uses it to signal a man on a neighboring island. He reads the message on her mirror, and sends the message via his computer to the coast guard station on the other side of his island. The Coast Guard captain reads the message, and runs to the break room, where the on-duty officer is sleeping. She bangs on the window of the break room to wake the officer, and then writes the message on the window, backwards. The officer reads the message, leaps in her vessel, and heads out to save the sailor. The messages were: “Somebody please help”, “Put the red wrench in the bucket”, “Tie the rope to the bucket handle”, “Lower the bucket to the side of my boat." We concluded our day with some experiments with pigment and paint. We mixed together water-based and acrylic paint in an attempt to find the right consistency for use with our printing plates. We played with watercolors, and tried thickening our water-based paints with rice flour to see what would happen. We made hand brushes out of wig hair and mop heads, and tried them out. At the end of the day, one of our dads played us some boogie woogie on the piano. In preparation for the day, we (the staff) cleared out the Studio to create a neutral backdrop for some experiments with photography. We blacked out the windows, and set up the digital projector in the adjacent room (the Gallery). We connected the projector to a laptop. When the children arrived, they began by sorting a pile of LED lights, keeping their hands occupied as we talked about our plan for the day. They selected different colored LEDs and taped them to batteries, creating instant little flashlights. Our conversation centered around the act of writing. I talked about the haptodysphoria I experience when I handle chalk, and about how unpleasant writing on chalkboards is for me because of the dry grinding aspect of writing with chalk. 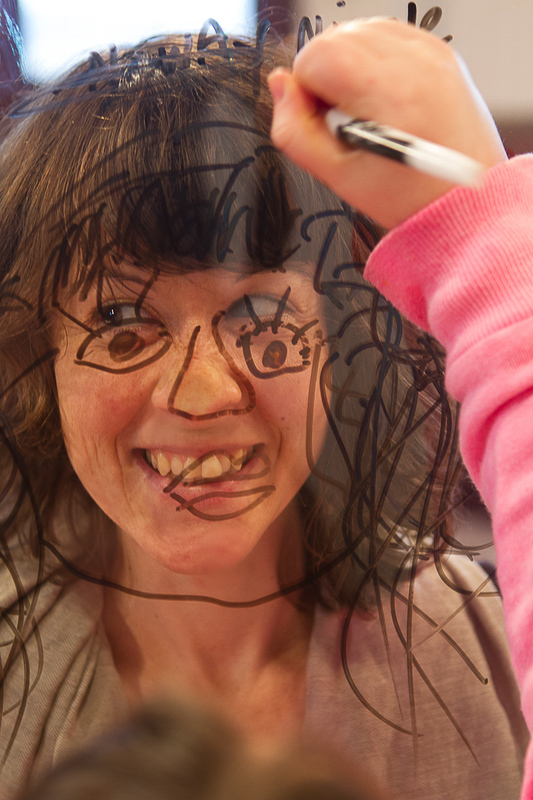 I told them that I much prefer the feeling of a marker on a dry erase board, or - even better - on glass. We spoke about what it feels like to write with a brush, and about what it felt like to write with the large brushes we made on the concrete floor of the Basilica. As we spoke, we looked at some examples of light-painting and light-writing. We looked at images from a Life magazine photo shoot of Pablo Picasso performing impromptu light paintings. And we talked about how painting with light was unique in that it was a method of writing that involved almost no friction whatsoever. Our conversation continued as I placed my camera on a tripod and we turned out the lights in the Studio. I asked everyone to consider how the light paintings we looked at had been made. Many theories were elaborated, but it was clear that the methods of light painting were mysterious to our participants - that it was a new idea to them. I turned off the lights, opened the shutter to my camera for 30 seconds, and wrote my name in the air using a flashlight. I sent the image to the laptop wirelessly, and we analyzed it on the projector screen. The kids picked up the technique quickly. They took turns directing the shoot. 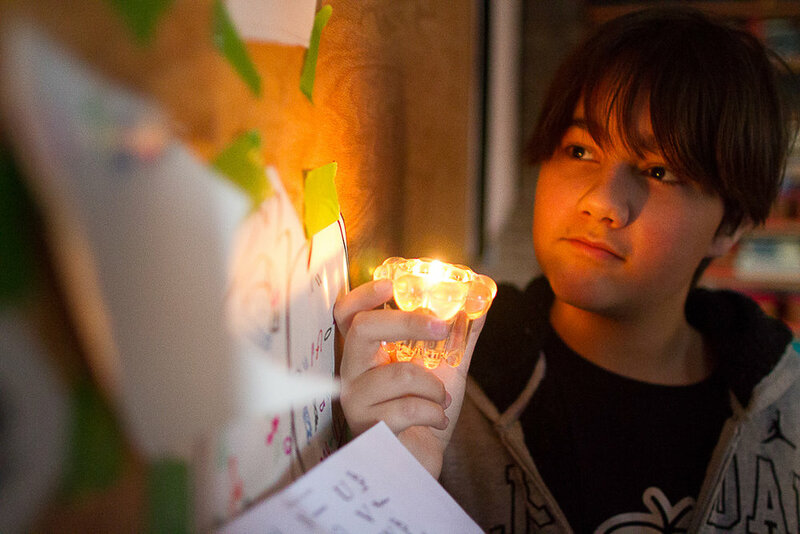 We wrote messages with light to one of our participants who was sick that day. While some children continued to write with light, our oldest participant conferred with Nicole about Egypt, as part of his research for an emerging activity we’re calling the Tomb Game. The premise of the Tomb Game rests on the realization that an ancient Egyptian tomb could be viewed as another portal through which only language may pass. Just as the telegraph and the internet demonstrate how written language can be used to communicate across great distance, Egyptian tombs are ideal examples of how written language has allowed us to communicate across great spans of time. The tomb is a place out of time, a portal between two cultures and epochs. A place that simultaneously exists in the ancient and the modern world. The Tomb Game is an attempt to collapse those two worlds: a game in which ancient Egyptians coexist with modern archaeologists, where pharaohs coax a group of researchers towards the cracking of the hieroglyphic code so that their story can be read. In developing the game, Nicole and our oldest participant discussed the ancient Egyptian system of writing, and created a key that matched hieroglyphs with their English phonetic counterparts. Nicole shared pictures of her visit to Egypt, and they practiced writing messages in hieroglyphs together. They experimented with the creation of wax stelae, to create a kind of Rosetta stone for the archaeologists to discover and use to decipher the hieroglyphs written on the walls of the tomb. Wax was heated in a double-boiler and mixed with an ochre pigment. We brought in a stone from outside and poured wax on it, to see if we could create a surface upon which words could be scratched, like a real stone stela. We looked at some charred wood fragments brought in by a participant, and saved them for later - to grind into a black pigment. Meanwhile, two of our younger participants opened a Word Store. Words available upon request. Words sold by the word. Bulk pricing available. 26 words for 7 dollars. Here’s how it worked: the children were the proprietors of a store that sells words. (“Words available upon request.”) Kaya and Sara played the role of writers in need of some words for a story. 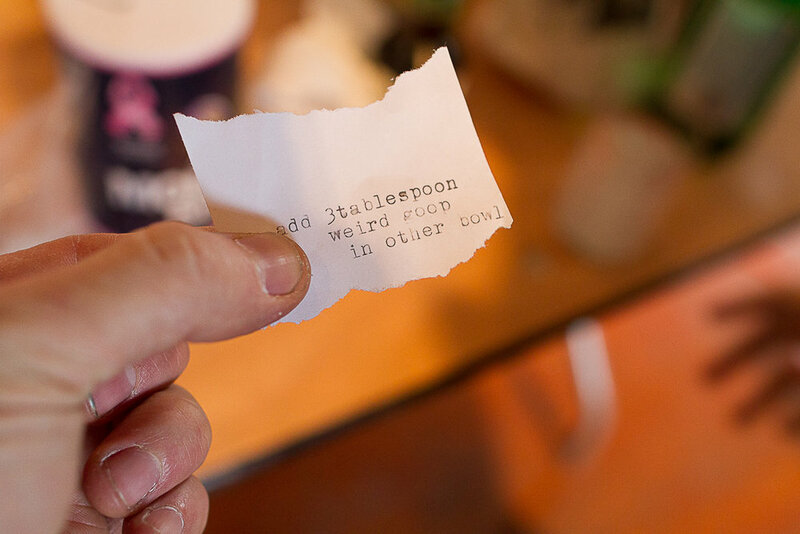 (“In order to write my story, we need to buy all the necessary nouns and adjectives.”) They placed their order by spelling out the words they wanted to the children shopkeepers, who would then write these words down on a roll of receipt paper, decide on a fair price, and sell that piece of paper to their customers. Kaya and Sara then worked with the other children to create a story that used all the purchased words. Here are the words: shadow, angel, Kaya, penny, moon, shooting star, galaxy, Milky Way, flying, rocket, UFO ship, meteor shower, grumpy, nest, koala, silver, sandwich, nostril, berry (straw), tree, purple, lilac, grunt, jump, sparrow, galaxy Here is the story they wrote with these words: “My name is Nostril. Today I ate a penny sandwich. I turned around, and I saw a shadow of a UFO ship flying through a tree. It made the sparrow jump onto a silver berry cloud! It made me feel like a grumpy koala, so I let out a lilac grunt until a shooting star made a nest in a galaxy called the Milky Way. It brought the moon a meteor shower for breakfast.” The children also sold some of their words to a guest who came by, for two real dollars. We ate lunch, and went into the Basilica to play tag and experiment with some long exposure photography, inspired by our light writing session. We imagined a story about a young ghost that haunts the Basilica theater, and managed to capture a few pictures of him. Returning to the Studio, we made a list of all the activities we had tried out over the previous weeks, and decided which ones we wanted to bring with us into the following weeks, and which ones we wanted to leave in the past. We asked that if a child was particularly interested in seeing a project continue to develop, they volunteer to “anchor’ the project. This means that they take responsibility for its progression over the next 6 weeks, making sure that it appears at our exposition during weeks 9 and 10. (Thanks to our friends at the Purple Thistle Center in Vancouver, BC for the “anchor” nomenclature!) In the final minutes of our day, we played with a volcano that one of our children had brought to share, loading it with baking soda, vinegar, red food coloring, and we watched the mayhem. Our day opened with a brief discussion (over peppermint tea) about what we are calling the Tomb Game: at the direction of one of our young participants, we are building an Egyptian tomb, which we will inscribe with a story in hieroglyphs about a departed pharaoh. In our game (currently under development), a group of archaeologists discover the tomb and attempt to decipher the writings. We discussed the game and planned the building of our tomb room with 4' x 8' sheets of plywood, to be painted white. We broke into two groups. One group went directly to the library to begin researching ancient Egypt, while the other stopped off to grab some white paint. Both groups met at the library. We checked out the library's entire collection of books on Egypt, with help from the library's Director, Emily Bennison. At the library, we noticed yesterday's cover of the New York Times, which had a story about modern-day Egypt. On the way back from the library, we stopped by the newsstand at the Amtrak station, and picked up yesterday's Times. We returned to the Nest. Hungry from our travels, we sat and ate our lunch while Sara read the newspaper article about Egypt out loud over the PA, as if she were reading the news on the radio, while kids performed public service announcements during breaks. The article was about President Morsi and current civil unrest in Cairo, and we talked a little bit about Egypt's recent as well as ancient history. At this point we needed to move our bodies, so we went down to the riverfront where we played football, built forts, and talked about our evolving game. Two of our participants pretended to be feral children who only spoke the language of the river; we were the first humans they had encountered in their lives. We tried to teach them English, and they tried to teach us their river language, which sounded like wind and rushing water. We returned to the Nest for the final half hour of the day to watch the beginning of a PBS documentary about ancient Egypt, called “Egypt's Golden Empire.” We also played around with the Hieroglyph Name Generator on the PBS website. 1. Put your right index finger in your ear, like you are listening to someone speaking to you in your headphone. 2. Hold a chisel-tip Sharpie in your other hand. 3. Take the finger out of your ear, hold up that hand with five fingers extended and count backwards from five, out loud. 4. When you get to "two," don't say the word "two," just mouth it and hold up two fingers. 5. Do the same for "one"
6. Put the sharpie in front of your mouth and speak into it. Be sure to introduce the station's cal letters, frequency and origination, or the imaginary FCC may fine you. 7. After you ask your interview subject a question, put the Sharpie a fist's distance in front of their mouth, to capture their response. 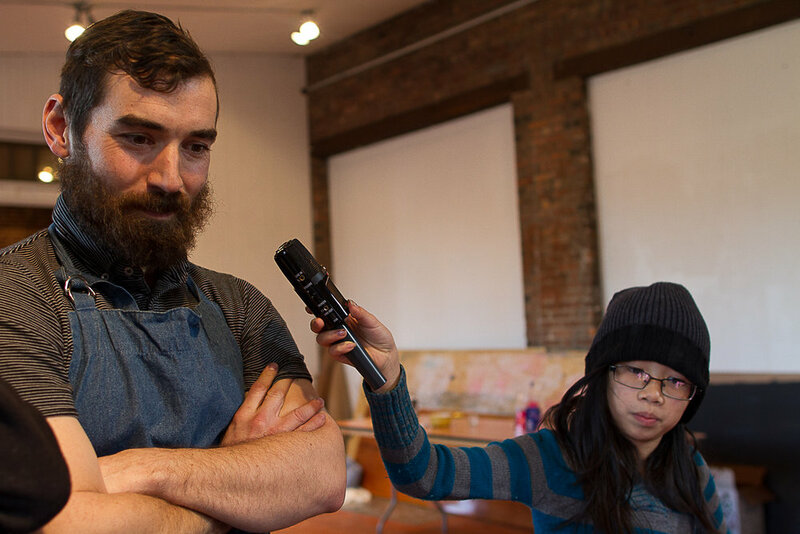 We interviewed our new participant on the air, and shared our own memories of travel. We spoke of where we have been and where we come from. Our intention was to create a space for children who have not yet found their passion for language to try on the identity of a deeply self-motivated writer or reader, like a costume. Our pharoahs left this code to be cracked: PHARAOH BOB. INVENTOR OF SOAP. KIND AND FUNNY. While the most industrious young archeologists worked to decipher the ancient text, the more restless of the group headed to the Basilica, where we played Alphabet Tag. While the Egyptians used various pigments to create colors, today we were interested in creating black paint from coal. To finish the day, we created some paint using charcoal and water, and brushed hieroglyph designs onto paper with phragmite fronds as brushes. We discussed the objects that we would want to take with us into our own tombs -- to have with us, forever -- and drew our own stelae with these lists. (Paper and washable markers, boots and snacks, and a lot of egg sandwiches.) More on ancient Egyptian art and cosmetics here and here . During Tuesday’s morning gathering, we drew out our plans for continuing to explore and practice some of what we have discovered so far over the course of Alpha & Omega: writing with light, paint-making, brush-making, large calligraphy, writing with glass, intergenerational and intermodal telephone, etc. We discussed which projects we might each want to anchor over the next five weeks: what we’d like to practice, develop, and eventually share with other kids and adults. Bryan revealed to the group an apparatus that had been hidden under a canvas cloth: our very own letterpress. We marveled at the machine, keeping a safe distance from its pinch points; we hadn’t yet been trained to safely use the press, so for now we practiced turning its lever, exploring the feel of the machine and its gears, and imagining what we might print in the future. At this point we splintered, naturally, to continue our work on various projects, including the Tomb Game and paint-making: In the gallery, we painted the third and final wall of our in-progress tomb. One child dove into the pile of books on Egypt that we had picked up from the library, sharing pictures he found of incredible ancient stelae (stone tablets) and the most creepy-looking tombs. In continuing to explore the performative nature of our developing "Tomb Game," – the joy that can be at the root of writing, reading, and cracking another's code – two kids played with mummification, experimenting with costume and theater for the game. For younger children, especially those most disconnected from the writing process, their entry point into the Tomb Game is through this kind of play. 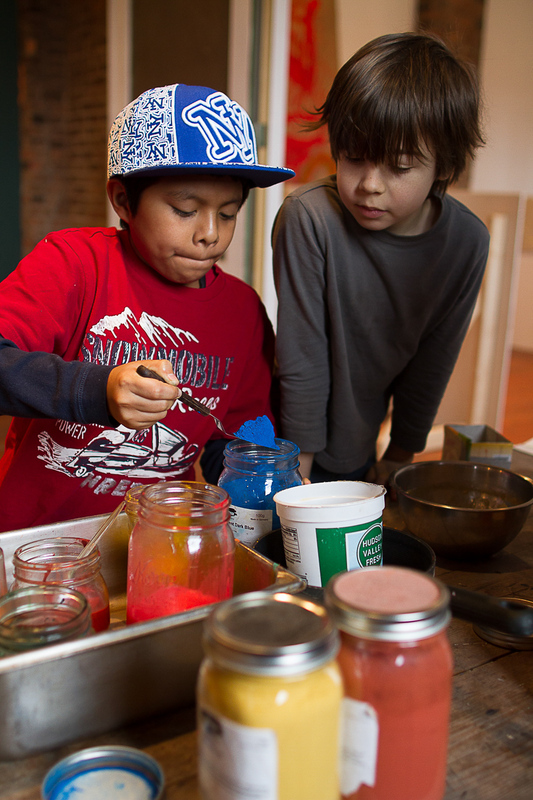 Two children shared a new method they had learned for making paint, mixing crumbled chalk with water to produce a colorful watercolor. We practiced mixing colors according to certain prompts – colors to paint a sunset, colors to paint an Egyptian color – and we took notes to remember our discoveries. (Notes on how to avoid ending with brown). We also worked to re-constitute the hide glue paint we had made weeks earlier and had since clotted, heating and stirring the paint until it became smooth again. And we built a sign for visitors: "learn about paint from experts." We took a football break in the Basilica before coming together again as a group. In our journals we took notes on the projects we planned to anchor, and as our conversation turned back towards language, Sara shared the Arabic alphabet. (Our brush-makers and calligraphists are considering practicing large Arabic calligraphy in the Basilica, which seems like a more visual alphabet to play with than ours.) Then, in order to create a space to continue to practice light-writing, we fashioned a temporary light-box room in the studio: closing off a corner of the room with packing blankets, a 4x8 piece of wood, and some C-clamps. 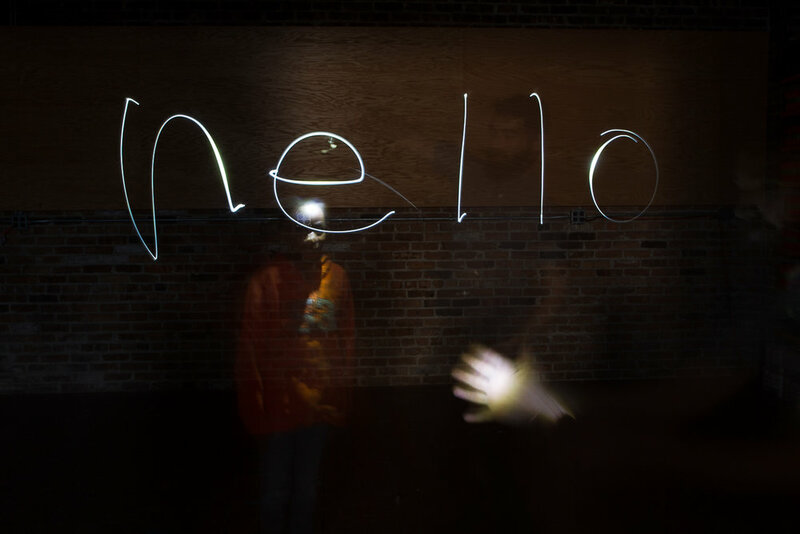 We practiced writing and drawing with light in the new space, the group rotating as writers and photo-technicians. Nicole arrived at the end of the day with an apple pie, in celebration of a birthday in the group. We celebrated. 1. The Front Desk. We staged a set of office supplies and clipboards for taking orders. 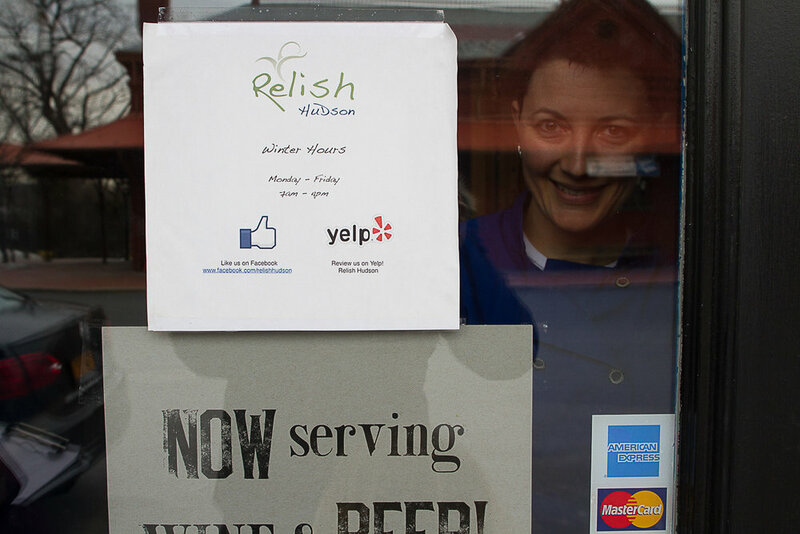 We taped a large sheet of brown paper on the wall to serve as our signage. 2. Type Station. This is where you select your type. We laid out our wooden type, and our galleys (metal trays). 3. Lock-up Station. This is where you lock up your type. Here we placed our furniture and our chase. (Furniture are pieces of wood of different lengths and widths, which you use to create a “form”. A “form” is the type that you wish to print, surrounded on all sides by wooden furniture and held into place by quoins. The idea is to create a form in which even pressure is applied to the type from all sides, so the type doesn’t move in the press when a large amount of pressure is put on it. 4. The Press. This is where our 200-pound Poco “Zero” galley proof press lives. Proof presses like this would typically be used in conjunction with a larger, mechanized printing press, used for high-volume printing; a printer would use a proof press to check their work, before sending it to the high-volume press. So a proof press like ours is a wonderful place for experimentation and creativity. We also like galley presses because they require metal galleys or trays to pull an impression, so we can have several children composing forms on several different metal galleys, simultaneously - rather than one child creating a single form directly on the bed of the press. And the bed of our proof press lies horizontal, whereas most high-volume presses have vertical beds, obscured from the view of the printer. So the printing process appears before your eyes, facilitated by a single, simple mechanism: turning a crank. We are beginning to understand the value of the advice we got from John Barrett of Letterpress Things. The printing press itself captured the attention of the group in this initial encounter - but what was amusing to us was that the most captivating aspect of the press’ presence was that it allowed the children to realize their dream of running a “shop”. Almost immediately, Kite’s Nest money was drawn out on post-it notes, an order-taking system was devised, and prices were outlined: 6 letters Max. $2 first print. $1 next print. We then moved into a tutorial on locking up a form. We learned how to tighten quoins, and told the group an anecdote we had heard from John Barrett in which veteran printers trick their apprentices by encouraging them to open the quoin until it snaps closed on their fingers. We each tried our hand at type-setting, and we opened a fresh can of black ink, awed by the goopy viscosity and the utter blackness of the ink. We used an ink knife to spread the ink on our glass. And we spread the ink on the glass with a brayer, listening for the specific, furry texture and paper-ripping sound that would tell us that the ink was spread right. We pulled our first impressions, hung them on our wall as samples, and began to solicit orders from people around the Basilica, or people stopping by the space. We gave them Kite’s Nest money, and then encouraged them to pay us with it. At the end of the day we took a trip to visit the river, which was just thawing from a winter freeze. We helped it thaw by throwing rocks at it. When we returned to the Nest, our first clients came to pick up their prints. We tallied our earnings for the day. After working with the tomb on Thursday, we realized that while it looked good, it wasn’t stable enough on its feet. A couple kids came in early today, so we got right to work creating some wooden buttresses to further reinforce the tomb walls. When everyone had arrived, we came together for discussion, and introduced this group to the concept of “anchoring” a project at Kite’s Nest. Everyone in this group wanted to do everything. What’s important to us about the concept of “anchoring” here is that it allows children to be a part of our projects in different ways. Some of our older children have the opportunity to bottom-line an activity, seeing it come to completion, and step into the mode of caring for their younger appears. But it also allows children to be excited about something, to engage in a game or an activity, without feeling like they have to commit to its unfolding over time. For us, this means that a younger child can be a part of a project that is beyond his/her developmental capacity, adjusting their involvement based on their curiosity, engagement, and comfort. We next moved to the letterpress, and introduced everyone to the system of apprenticeship around its use. We realized quickly that the letterpress table was too high for our smallest children to operate it well. Kids got to work making a sturdy printer’s stool, so they could be positioned up above the action. In building the stool we used circular saws and power drills to create the buttresses, and we familiarized ourselves with the mitre saw, the carpenter’s square, and tape measures, both digital and analog. While this was underway, some children practiced typesetting, while another group worked to make hide-glue paint, for the purpose of decorating our tomb with hieroglyphs. When the hide-glue was finished, we set up an extra 4x8 sheet of plywood, to begin painting. For some children, this was an opportunity to practice their hand at hieroglyph-painting for the eventual tomb. Others took the hide-paint in a different direction, playing with the color and consistency of the paint. They tried diluting the paint with water, pouring it into small bottles, adding mineral oil, letting it drip and soak through sheets of paper. We quickly wrapped a table in practice, to set up a station for pure paint-experimentation where this creative, alchemical, and messy work could unfold. Toward the end of the day we returned to the letterpress, where this group learned to ink the press for the first time, and pulled their first impressions. WGXC: A reminder to programmers to announce the WGXC phone number (specifics left at our discretion). Today’s morning meeting began with a discussion of the future. We realized that the foundation for our soon-to-be kitchen was being poured today, which presented us with the exciting opportunity to preserve a bit of the “now” in the form of a time capsule. A metal can served as our capsule. Like ancient Egyptians, we would create an archive, albeit a small one, of our culture to pass on to future societies. We thought about possible scenarios for our how our time capsule might be opened in future generations, and about the people of the future - how would they look? And what would they think about the past (us?) Someone suggested pictures would be an important medium through which to convey information about our society. One child thought a baseball would be a better object to pass on. We settled for written notes, which we wrote with gloved hands, so as to prevent the oils from our skin from deteriorating the messages in ages to come. One interesting outcome to this process of capturing written “snapshots” of our present was that by exploring what we would want to express about ourselves to future generations, we became increasingly conscious of ourselves. Someone asked, “Why would future people care about me anyway?” Another child expressed some cynicism about our current culture, remarking on how “messed up” things are. Why we should care what future generations think? Would our legacy be as powerful and compelling as the ancient Egyptians’? Here are some of the ideas we came up with for filling our time capsule: poetry (both personal and well known lyrics); a picture of the whole Kite’s Nest crew, at the very site in which we were to deposit our time capsule; stamped initials on our notes with letterpress font; our names, dates, and other documentation of time and place; an apology for our environmental failings; and humor, in case the people of the future forget how to laugh. One child wrote: “Way back then, there was a building called the Basilica.” After lunch, we created a big map of the various projects that were in-progress in our space, and put it up on the wall for reference throughout the coming weeks. For the rest of the day (with a break for some hockey in mid-afternoon), each student worked somewhat independently, with guidance and support. Here are a few of the discoveries and progresses made towards our exposition date: Inspired by the visual appeal of hieroglyphs, one of our youngest participants and writers began thinking about his own alphabet. We looked at a printout of the Arabic alphabet, and at the English alphabet. He began designing his own alphabet, with influence from hieroglyphs, arabic letters, the typography of letterpress, and his own scribble-style. Our most skilled and focused letterpress-printer returned to the letterpress, to continue working on orders he had collected from stores around town. One participant got to work on a historical fiction piece about an ancient Pharaoh, beginning by reading some of the books we had taken out from the library. His “mind was blown” when he learned that the average lifespan of an ancient Egyptian was 25 years -- a fact that forced him to rethink the fundamentals of his plot. He talked through his ideas with Audrey, who encouraged him to ground his plot in as much historical truth as possible. They discussed how historic fiction is a genre that allows a writer to play with history -- to work with a set of constraints (fact, truth) in order to weave a new narrative through the fabric of the past, creating something new and exciting through the pattern of the old. It was difficult for him to have to constrain his ideas in a set of firm constraints, but he finished an introduction to his novel, with some appreciation for how difficult (and rewarding) it can be to write historical fiction. One child began working on illustrations for the historical fiction -- based on a book we had about King Tut, his life and legacy, and the objects inside his tomb. Another child set to work planning for her evolving paint-making station/shop; creating signs for the space, and a shopping list of materials. Her and Sara also talked about the history of the Basilica, which used to be a glue factory. Sara talked about people she has interviewed in Hudson about their time working in factories, and about a story she has heard about a glue explosion in the factory. We realized that we were making hide-glue paint in a building that had once been filled with hide-glue. Over tea we talked about the projects we’ve all been working on here, and discussed some of our goals for the day. By the end of the day, we wanted to have done the following: imagine and develop a paint shop in our space, and how it might function; move forward on our letterpress orders in the print shop; research and create some costumes for the Tomb Game; begin work on our hieroglyph key; practice playing the Tomb Game; and deliver some of the prints we’ve finished so far. The conversation then drifted towards language. What makes a dead language dead? ( A language is dead when no children are being socialized into a language as their primary language, so it won’t cross the generation.) We talked about sign language, about grammar, and about tonal languages; we discussed how grammar works in Japanese, and then practiced some invented languages (gibberish, and cling-on). One group went to work on re-constituting the hide paint, according to a new method we had learned. Instead of using a double boiler, we poured boiling water into a pan, and set the jars, filled with the gelatinous paint, in the same pan. Almost instantly, the paint began to liquefy. We also began to set up and develop the “Paint Shop”. 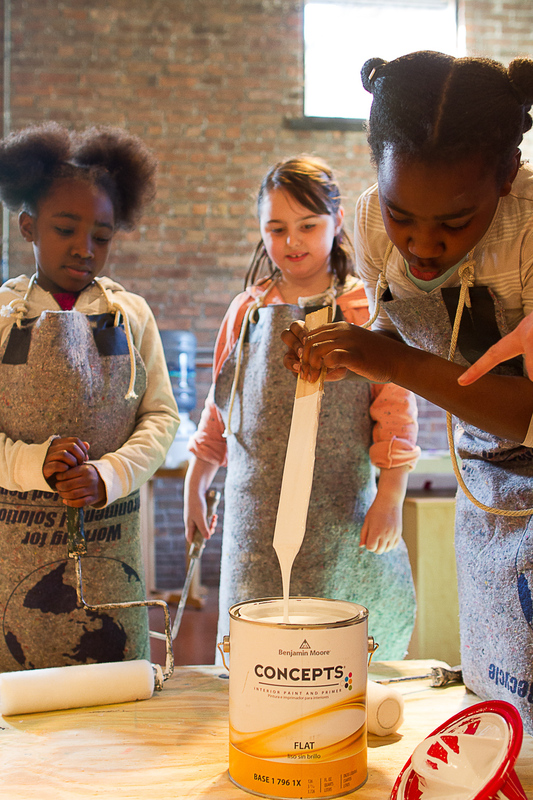 We imagined a shop that sells paint, but that also teaches interested customers to make their own paint. We made a sign for its entrance: “Paint Shop. We Sell and Teach.” (We discussed, briefly, businesses and organizations that prioritize things other than profit.) Our printmaker headed to the print shop, to continue working on the print orders we had received last week. He printed a page that said “HEATHEN FILMS”. According to him, “It was pretty simple to set, but a weird word. Not all the furniture fit always. It turned out great, but I’ve only done the practice so far, and so now we have to do the real one.” Meanwhile, another group began creating a “legend” for the tomb game, which laid out a version of the hieroglyphic phonetic alphabet for us to use to communicate messages. (In the process, we have modified our hieroglyphs slightly to make them slightly easier for children to draw. When we came together for lunch, we continued talking about language. We listened to someone speaking “cling-on,” the fictitious language from Star Trek, and we talked about how languages evolve over time. We realized that the process of words changing over generations was a lot like the intergenerational telephone game we’ve played in the past, where messages evolve as they get passed down. After lunch we walked together to Relish, a restaurant nearby, to show the restaurant’s owner (Dana) the sign we had made for her, which said “NOW SERVING WINE AND BEER.” She thought it was great. Then we drove to Swallow Coffee, and talked to them about what we might print for their business. They asked for signs that said, “Cash Only,” and “We Heart Small Bills.” We also drove up to Bonfiglio and Bread, where we showed the owner (Gaby) a sign we had made that said, “BREAKFAST ALL DAY.” In exchange for our sign, we were given cinnamon buns. We celebrated our outing with a tasting of our goods, before delving back into our projects. One group worked together to create three statements about a pharaoh, transposed in hieroglyphs, and written onto the inside walls of the tomb. They also planned a series of sequential clues to be given to the archeologists, and the theatrical elements of the game: clues written on strips of leather to be passed through the cracks of the tomb wall, and little snakes and scorpions to be thrown as curses against the archeologists. Inside the tomb, three stelae were left to be discovered, each with two of the hieroglyphs deciphered, as a partial-key. Encoded: THE KINGS WEPONS WERE SCORPIONS AND SNAKES. KING TUPY. Decoded: THE KINGS WEPONS WERE KETCHUP. We celebrated the successful launch of the tomb game, all of our work, and we closed the day. The children we work and play with love to play at work. If we are making paint together, our space becomes a paint-store; if we are writing, before we know it we are in a word shop, selling and exchanging words for stories. And spontaneously, since the beginning of our workshop, kids have been making money -- they’ll pause mid-play to draw some hundred-trillion dollar bills. Sometimes, abstract activities can becopme accessible to children through the metaphor of the store. Language is, after all, a part of the work of the world. And while this isn’t ever our intention or plan, we do believe that the paint, the words, and the written, drawn, and built creations of our participants are of real value to the world. So we’ve jumped on children’s love at playing “work”. Today we turned our full attention to it, designing some Kite’s Nest money, and having a discussion about exchange and value. We began by projecting images from the Dollar Redesign Project on the wall, and looked at some attempts to re-design and re-frame the dollar; if we were to create a currency of our own, what might it look like? We looked at images of currencies from Japan, Venezuela, South Africa, and India. What kinds of symbols, words, or images might our currency have? What if our “dollars” always reminded us of those things that are more valuable than money, like friends or family or happiness? (It turns out our participants are also pretty serious about aesthetics -- I didn’t know fonts could stir such passion among children.) So around a table of markers and paper we began to construct our own Kite's Nest currency, each of us choosing a theme for our illustrations, with group consensus. Our themes were: HAPPINESS, EARTH, FAMILY, FRIENDS, and PEACE. While we drew, we also listened to an excerpt of a This American Life podcast, called the “Invention of Money”. The podcast tells the story of a pre-industrial society on the island of Yap in the South Pacific, that used giant stones as currency -- massive stone-coins that could weigh more than a car. A strange story that speaks to a very basic question: what is money? We imagined paying for something with giant stones, and we talked about other kinds of exchange that we experience everyday. And we talked about some of the tools and trades that we had explored at Kite's Nest, that we might be able to exchange with the world. After completing all of our designs for Kite’s Nest dollars (including bills of $1, $100, $1 trillion, etc. ), we took a break to run around in the Basilica -- using our camera to take action shots of our play. We came back together in a circle for continued conversation about our upcoming exposition, and what we call visitor experience. 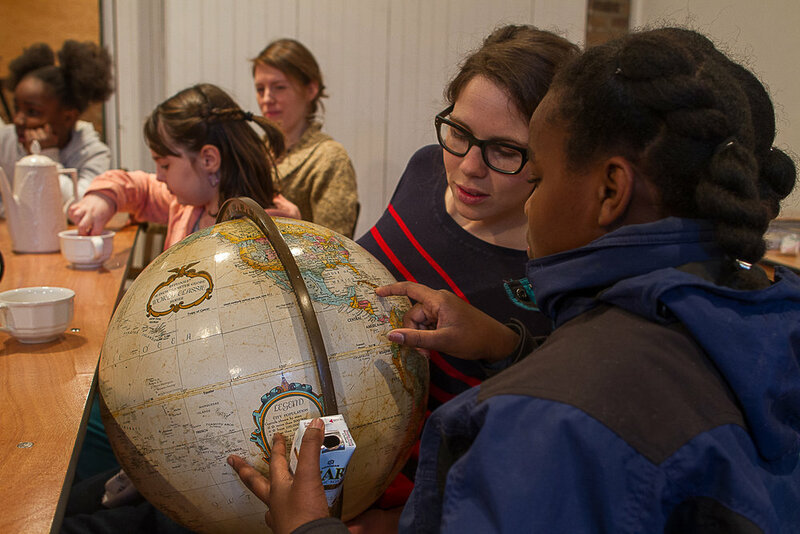 What might happen when someone arrives at our Museum of Language? Will they be given Kite’s Nest dollars before or after they enter? What will the space look like? We began moving through the studio, gallery, and workshop together, envisioning possible layouts for our exhibits and “shops.” We each took some tape to mark our imaginings, and then set up some of the infrastructure (the Tomb, the letterpress tools and objects, the paint shop), of our emerging Museum. While we were working, a visitor arrived to make a printmaking order for an event next week. She asked for four prints: three numbers, and then the phrase, “I Said Yes!" 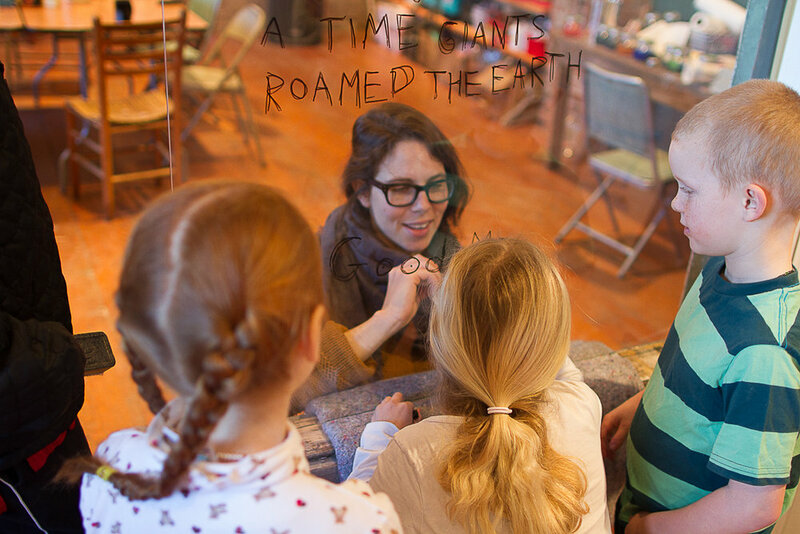 We took her order, then broke into groups for the following work and play: One group assembled our new wooden frame for writing-on-glass, which they hadn’t yet seen. They didn’t know what they were building until they were finished, and guessed along the way. Just as they had finished putting the frame together we were visited by a family with two children; the builders showed them the glass-writing set-up, and shared some of the games we’ve created with the exhibit. Another group jumped into paint-making, this time using elmer’s glue and pigment to mix the paints. We rolled out brown paper on the floor for large-brush calligraphy with the paints. With our master printer at the helm, and two recently certified printer-apprentices by her side, we printed the order we had received earlier in the day -- for an incredibly fast turnaround. They printed on small card paper. They also shared their work and process with our visitors, walking them through the steps of using the letterpress. Towards the end of the day, we all came together to celebrate some of our progress, and to imagine more people visiting the Nest. We concluded the day by watching the French animation film, “The Tail of the Mouse,” and playing some games of "Down by the Banks of the Hanky Panky." We transitioned, next, into the world of radio. We turned the lights off, lit some candles, and Sara played some sounds: sweet trance music, crickets, and Studs Terkel’s The Human Voice. She asked: what do these sounds make you feel like? Then we listened to some radio PSAs, made by kids. We talked about them -- what we liked, and what we didn’t like. For our own PSA, we decided to record a game of telephone, using our event announcement as the message to be passed down and morphed. This audio would be then edited into a PSA. 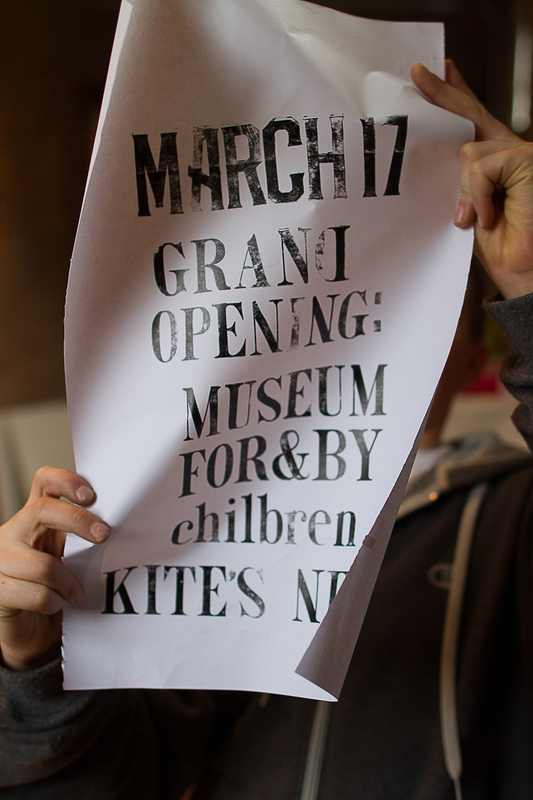 The first message was: On March 17th we invite you to the grand opening of a new museum, for children by children. 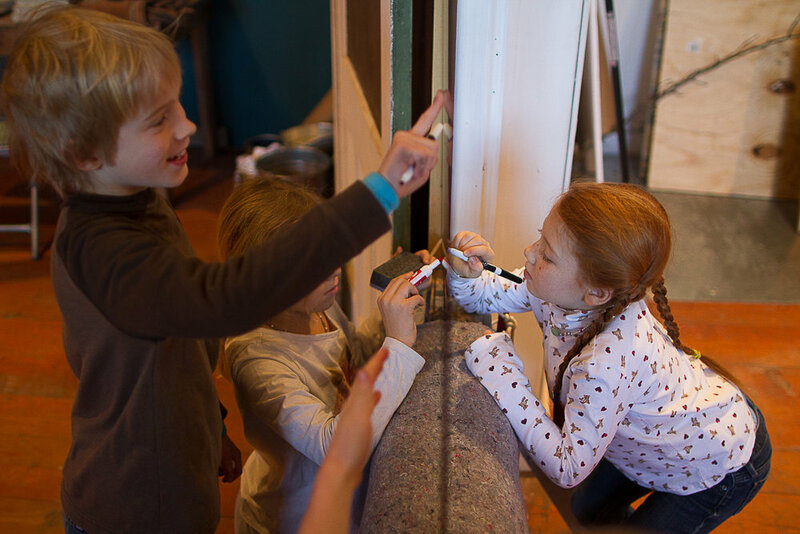 The message became: On March 17th we invite you to a museum for body kids. The second message was: Decode hieroglyphs. 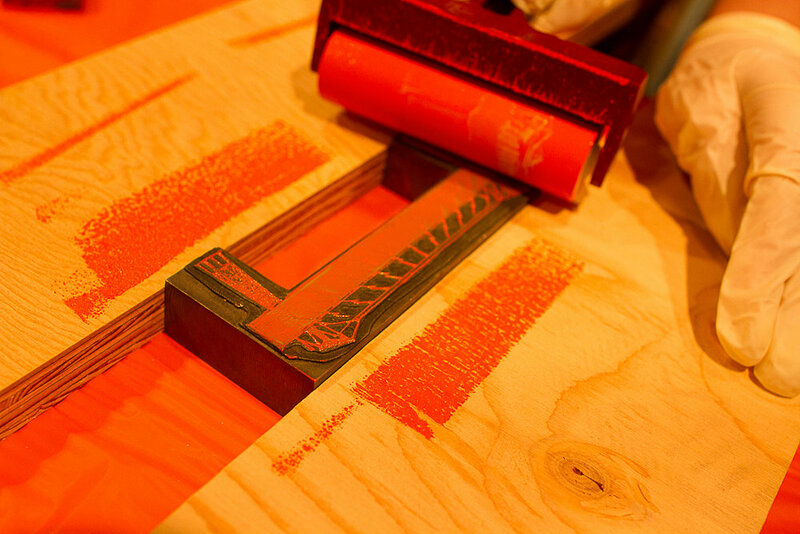 Operate an old-fashioned letterpress. Write with a giant brush. It became: Takroheigonyphcs. Paint with a paintbrush. We spent our day painting collars, sewing aprons, making a batch of hide glue paint, splattering paint onto things, and most importantly, talking about our upcoming exposition and the experience of the visitor as they enter our world. A producer from a youth radio show on WGXC came down to Kite’s Nest today to help us create a public service announcement for our upcoming exposition. She conducted a series of interviews with our children. 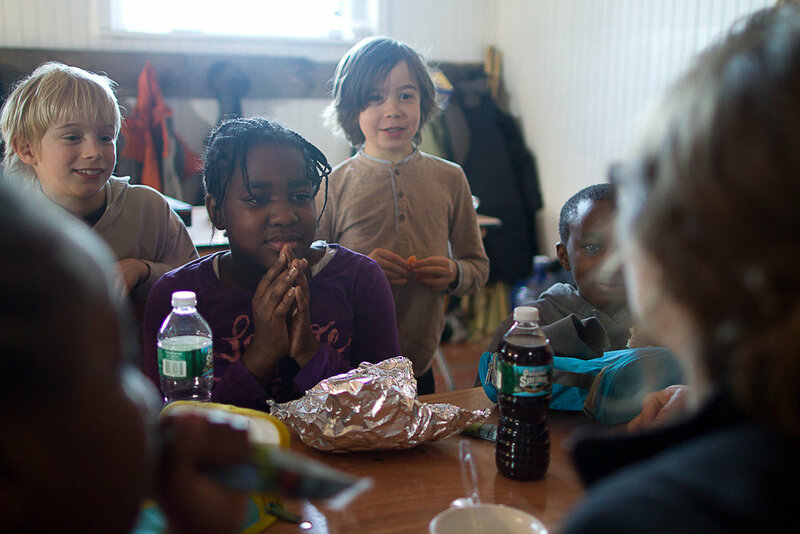 For us facilitators, it provided a candid view into how children are thinking about the work they’re doing, what excites them, and what of the things they’ve learned have proved to be the most durable. She provided our group with a legitimate audience for their work: a curious adult, completely unfamiliar with what we’ve been up to. It was great practice for the children, as they are about to enter the exposition phase of our workshop - a time in which they will present, explain, and demonstrate their work to a changing audience of children and adults. We dove into our pile of books about ancient Egypt today, looking specifically for the collars worn in ancient Egypt, and the kinds of decorative patterns they used. 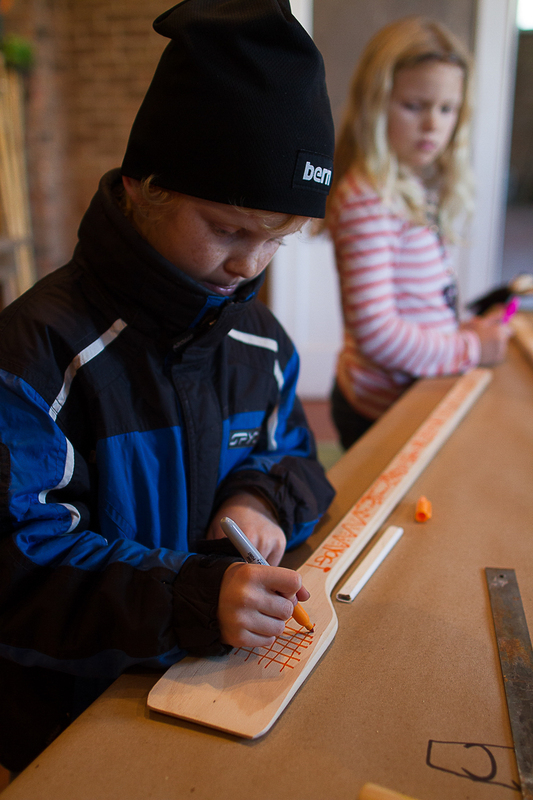 We set to work on our own collars, drawing on cut-out canvas. 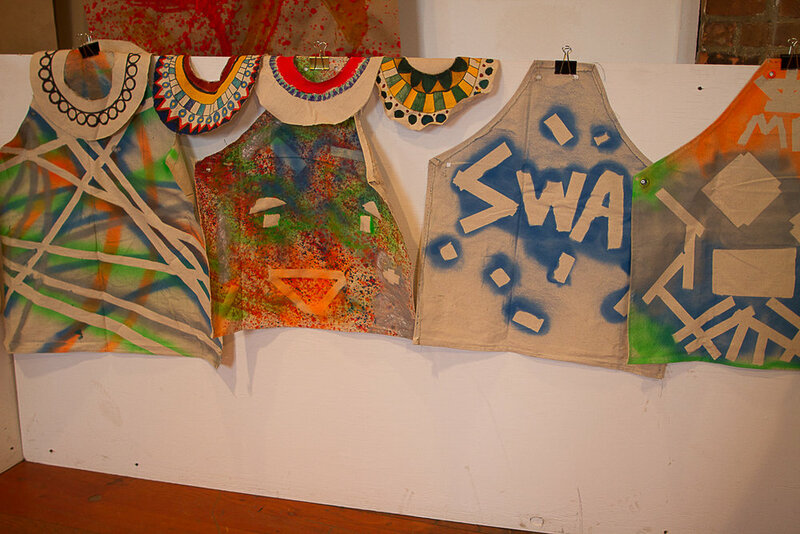 A small group made paint, to finish splatter-painting their aprons. One of our participants said she wanted to go outside, and write down the names of the things they encountered. And so another group went on a walk, with notebooks in hand. 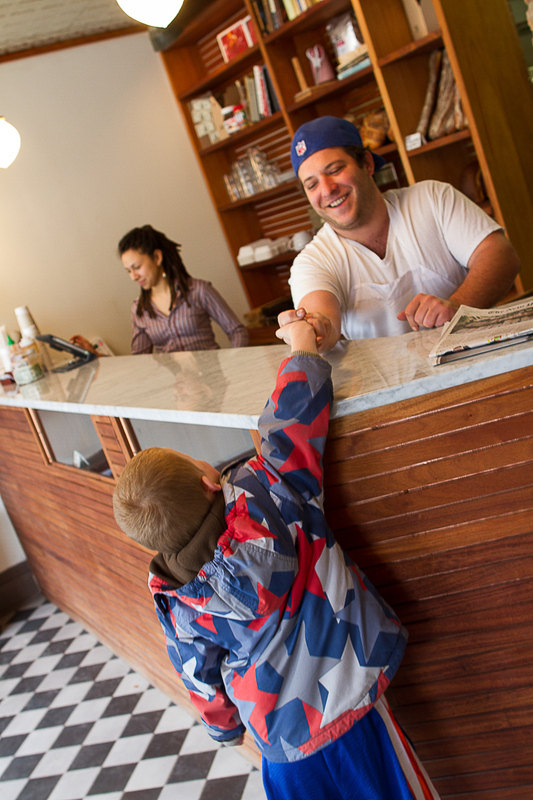 We are located down by the Hudson waterfront, on the edge of the city -- a prime location for exploration. According to her field notes, they saw: a snake, a pond, a ladybug, a train, a rock, and more. Our letterpress crew also got down to business in printing posters for our exposition. This was the first time we had had the letterpress rolling in full operation (called editioning). These were hybrid posters, with one part modern-laser print (our header and footer) and one part antique wood-type letterpress. Today we threw down the gauntlet to our youngest students, challenging them to take a galley full of type that we had locked up over lunch, and under Bryan’s supervision but with no assistance ink the glass, ink the type, properly register the paper, and pull an impression, using the correct amount of backing paper and creatively accommodating for certain letters that are no longer type-high. All four of our youngest participants passed this certification process with flying colors. What is especially interesting about this is that I believe their proficiency came not from hours of previous practice on the press, (which some of them did not have), but rather from being enthusiastic observers of older children using the press. One of our youngest participants has spent very little time operating the press; his older brother, however, took an immediate affinity to the press and has been running it for weeks now, usually with his younger brother by his side. 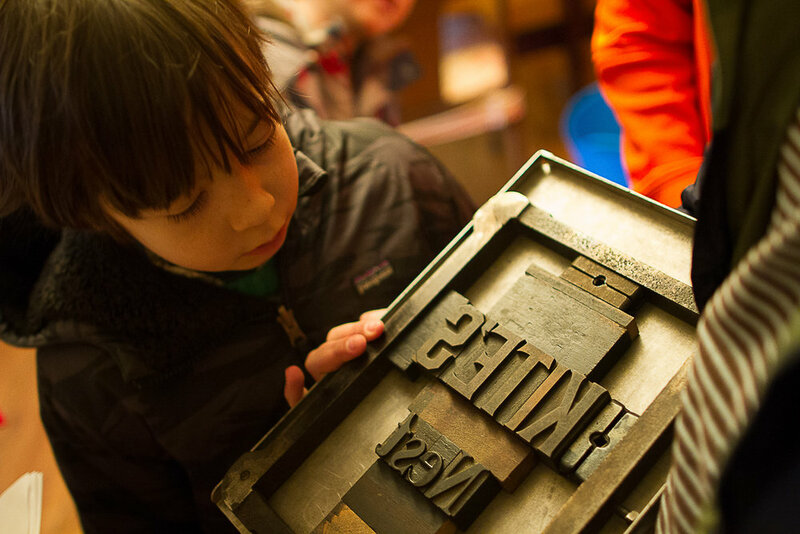 We were also amazed by the retention of letterpress terminology that the children had, given that this terminology was introduced to the children not in a didactic manner, but only in the working context of the letterpress. Whenever we are printing, we are constantly narrating the printing process to whoever happens to be in earshot -- marrying the language of the press with the act of printing. The youngest children, though prohibited from operating the printing press on their own, were still legitimately participating in the printing process, through their observations. When one is certified as an apprentice printer, one learns a secret handshake. We also decided that we would need to adorn our smocks with a certification badge, so that our guests would know who they can speak to about printing at the museum. One: Bird Eye was orphan, adopted by pharaoh. Two: Bird Eye’s father said “Unite North and South”. Bird Eye became pharaoh. Three: Bird Eye killed by southern arrow. Death united North and South. We began the day with collar-making, so that everyone could finish their customs for our upcoming exposition. One of our participants had brought in a sewing machine that he had recently received as a gift. He staked the claim against some opposition that sewing machines are cool, and for boys, too. We fired it up in the service of sewing pockets on someone’s smock The sewing machine was brand new, and so together we had to figure out how to set it up. We ran the sewing machine through its paces, asking it to sew through both canvas and felt at the same time, causing it to malfunction. In fixing the machine when it broke, we unscrewed the plastic face covering the bobbin, and came face-to-face with its complex and confusing inner-workings. This was an ideal moment to watch a great film: Tim Hunkin’s “The Secret Life of the Sewing Machine,” which explores how a sewing machine functions. At one point, they demonstrate the main principles of the machine by making a huge, human-size sewing machine. One of the children also brought a toy with him today -- a little battery-powered jitterbug (a bristlebot). The jitterbug was exciting enough to pull attention away from the project we were working on -- especially when we discovered a styrofoam packing container, which immediately became a labyrinth for the bristlebot to navigate. We were charmed by it too, and embraced the distraction -- it became our lunch-time play. What we liked about it was the way in which our children were able to work together on creating a habitat for the bristlebot, in a purely collaborative way. It acted enough like an organism to elicit the same behavior that we might have around a gerbil or a hamster. (And none of the risk.) And everyone was engaged. We played with building obstacles and paths for the jitterbug, and continued playing over lunch. 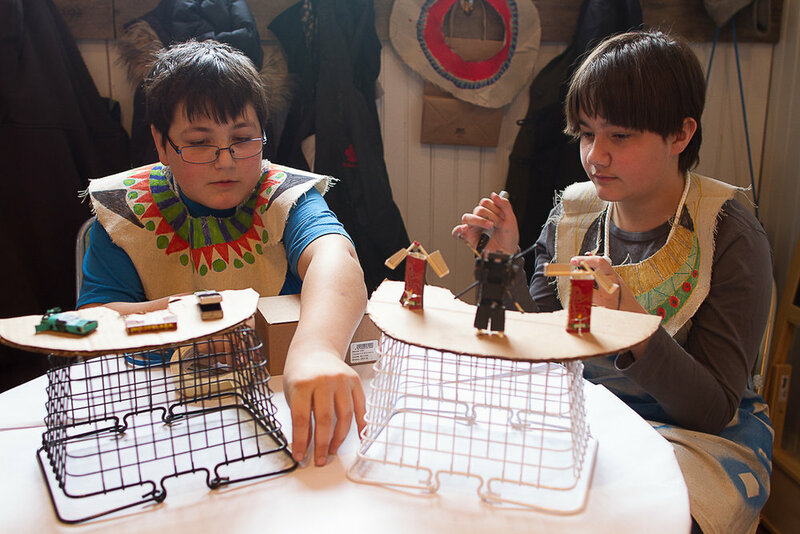 Another one of our participants, in his spare time, has been figuring out how to take small boxes -- such as matchboxes and playing cardboxes-- and cut them in a pattern so that they transform into robot-like figures with moveable arms, legs, and a pop-up head. He brought in an array of prototypes, and proposed the idea that these paper craft transformers be an item that we might sell here at Kite’s Nest at public events (like our upcoming museum opening). Bryan invested $1 into his business idea, and we agreed that should sales be successful, he would receive $1.25 in return for his investment. He shared his prototypes with the group, and received feedback about his designs. We left the Nest after lunch on a flyering campaign, hitting up multiple local businesses on Front st., Warren, and State St. We also solicited for donations of small boxes for the papercraft transformer enterprise. We returned to the Nest, to find Sara hard-at-work editing our one-minute public service announcement for broadcast on WGXC. She played us some delightful clips, so we ended the day laughing. One of our older participants worked with us to create a letterpress nametag, to be worn by our young staff at our Museum opening. We spent a while troubleshooting the fact that our only capital “N” (the N in Kite’s Nest) was damaged, and no longer type-high. We created a set of paper shims to remedy the situation, and dropped them into place with a pair of scissors. We completed decorating our pectorals (collars). We measured and cut the lumber necessary for our printer’s stool, and tested its strength by jumping on it a lot. We applied an ancient Egyptian motif to everything we could get our hands on: our collars, our printer’s stool, and the walls of our tomb. And we put cameras in the hands of some of our children throughout the day, so they could document their work themselves. After such dedication to preparing for our expo last week, we felt that the children deserved a day oriented around play, a day to relax and let loose a bit before the flurry of activity that awaits us this weekend. After such dedication and investment of energy in preparing for our expo, we felt that the children deserved a day oriented more around play, a day to relax and let loos a bit before the flurry of activity that awaits us this weekend. Prior to the arrival of the children, we hauled a canoe into the studio - an old vessel we had received as a gift so that we might restore it, or at the very least play with it. The canoe immediately became a prop in a round of intermodal telephone, our first activity of the day. We used the “sailor in distress” story again, with a few tweaks: A sailor passing by an archipelago of tiny tropical islands springs a leak in his boat, and broadcasts a distress message on his ship-to-shore radio. On one of the tiny islands there lives an old blind man, whiling away his days listening to his various world-band and ship-to-shore radios. The only other inhabitant of the island is an elderly gentleman, quite hard of hearing, who used to run the island’s newspaper when the island was more populated. Now that the island is nearly deserted, he writes and prints a newspaper for himself each day, full of his observations on the weather and the horizon. These two men used to be friends, but twenty years ago, one of them ate the other one’s sandwich without permission, and they have held a grudge ever since. On the very-close-neighboring island, also sparsely populated, lives the combination Fire Chief/Police Chief/Postmaster General, who possesses the islands only computer with an internet connection. Using this computer, the Fire Chief/Police Chief/Postmaster General can chat with the Commander of the Coast Guard, who lives on the other side of the island at the Coast Guard headquarters, along with a Coast Guard Pilot. The message passing went as follows: Sailor sends a message via radio (wireless headphones) to the Old Blind Radio Man. The Old Blind Radio Man then walks over to the Old Deaf Printer. They set aside their differences, and the Old Blind Radio Man (blindfolded) writes down what he heard on the radio. The Old Deaf Printer sets this message in movable type, takes it out to the beach, throws a coconut across the water to the neighboring island and gets the attention of the Fire Chief/Police Chief/Postmaster General. The FC/PC/PG uses binoculars to read the message set by the Old Deaf Printer. The FC/PC/PG then types this message into a chat window to the Commander of the Coast Guard. The Commander goes to rouse the Coast Guard Pilot, who has locked herself in the breakroom, fast asleep. The Commander bangs on the glass window of the breakroom, and writes orders to the Pilot backwards on the glass using a dry erase marker. The pilot wakes up, reads the message, and leaps into action, heading out to save the sailor. This game was partially inspired by the appearance of a young coconut, brought as a gift to share by a thoughtful parent. After the game, we opened up the coconut with a drill, and shared the coconut water. After this, we played in the Basilica a bit, visiting a woodworker who was there to fabricate some new doors for the main hall. We played tag, shot rubber bands at each other, and took long-exposure photographs of one of our children, who was wearing light-up shoes. Returning to the Nest, we got to work, researching and designing various ancient Egyptian motifs to decorate the tomb, sketching, tracing, and painting. Today we held a “dress rehearsal” for Sunday’s exposition, and invited some friends to visit the Museum of Language at 1pm. There was much to do in preparation for their arrival: we had to finish decorating the tomb for our first public run of the Tomb Game, and finish writing the hieroglyph messages on the tomb walls; we had to set up the paint-shop, large-brush station, and area for large-brush calligraphy; we had to organize our letterpress area; and we had to get ourselves in costume, and ready to greet some visitors. Two of our participants also set up a concession stand, to share the proto-type transformers they have been building with match boxes. The rehearsal was a success. We realized quickly that we needed someone to be a greeter at the door, so one child took on that role, guiding our visitors into the space. 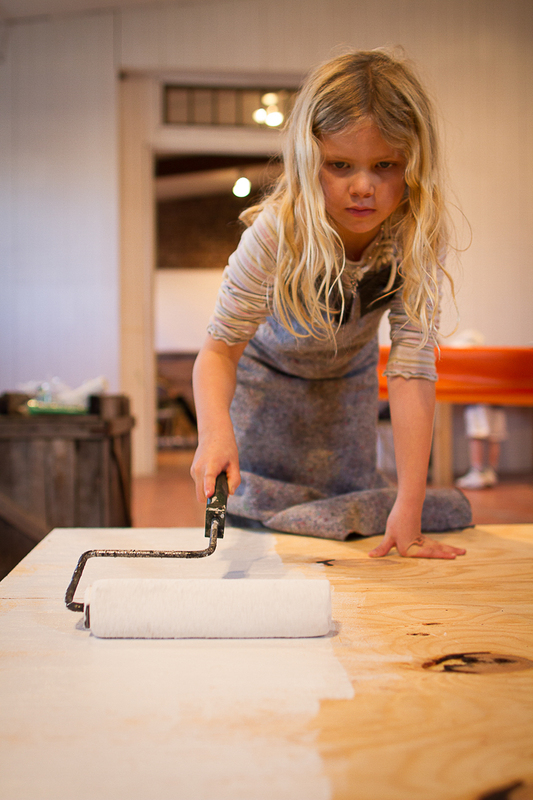 Our paint-makers helped each visitor mix a paint color, rented them brushes, and walked them through the calligraphy station; our printer and printer’s apprentice shared their letterpress skills, and printed custom posters for each visitor. When everyone had sufficiently explored the exhibits, we announced the beginning of the Tomb Game. 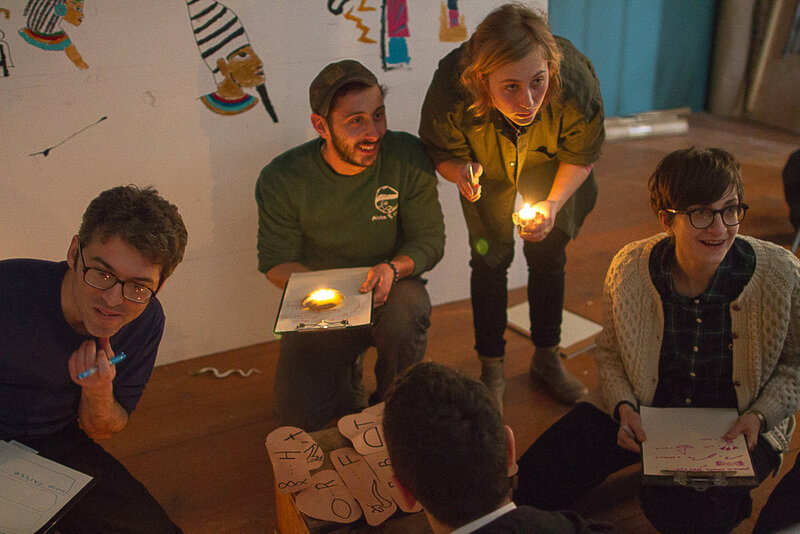 We gave our visitors the tools for their archeological expedition (candles, clipboards, instructions), while all the children got into their roles, behind the tomb, as mischievous pharaohs. We dimmed the lights, put on music, and the archeologists got to work cracking the code, with hints and taunting coming from behind the walls. This was our first time playing this game with a public audience; it was truly fun. We ended our dress rehearsal with a conversation about the Alpha & Omega workshop, and the weeks that had led up to these exhibits. Our fiction-writers told the story of the pharaoh who had left his messages on the tomb walls. We also heard feedback from our visitors on their experience, asking them what they liked, and listened to suggestions they had for us in preparing for our public event. Thanks to all of our dress rehearsal visitors!